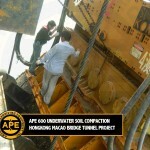 APE China’s first 400 built in China get’s the job done! 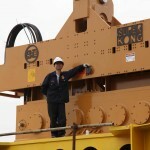 APE China (Shanghai ZhenLi) has sent it’s first model 400 hammer that was built in China to a job in FuJian province. 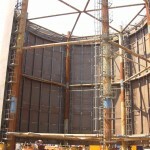 The customer had difficult soil conditions with thick clay layers at the top. 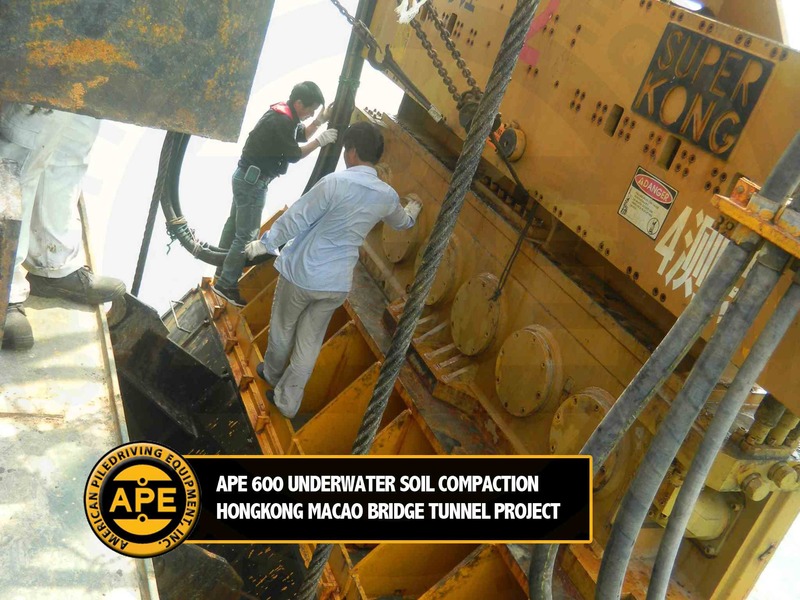 They were originally considering excavating out the top layers but when they heard about the APE 400 they decided to give it a try. 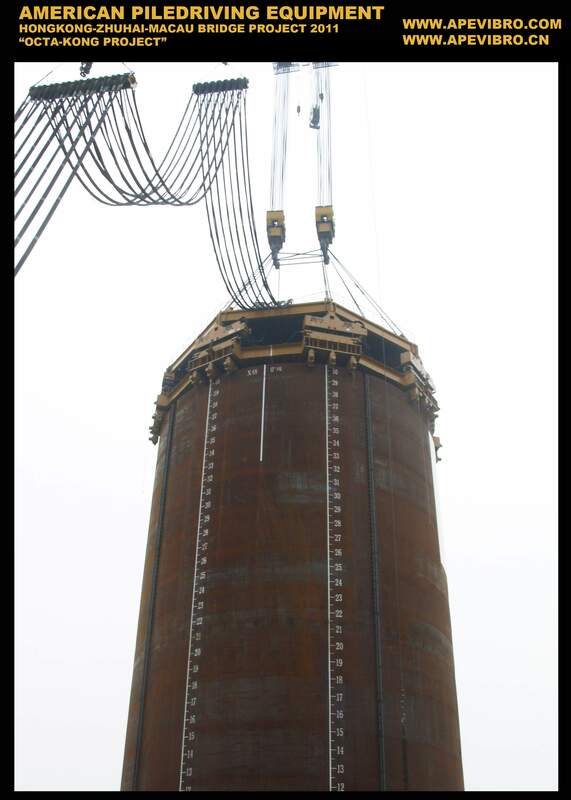 Suspense was in the air as many doubted the 400 could drive the 36″ X 72′ long pile to grade, many were utterly convinced the 400 hammer would not be able to drive to the pile all the way down. 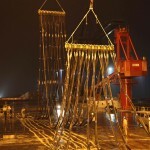 After the hammer was lifted on the pile some fireworks were let off to set to scare away the evil spirits, as custom in China, 18 minutes later the pile was to grade! 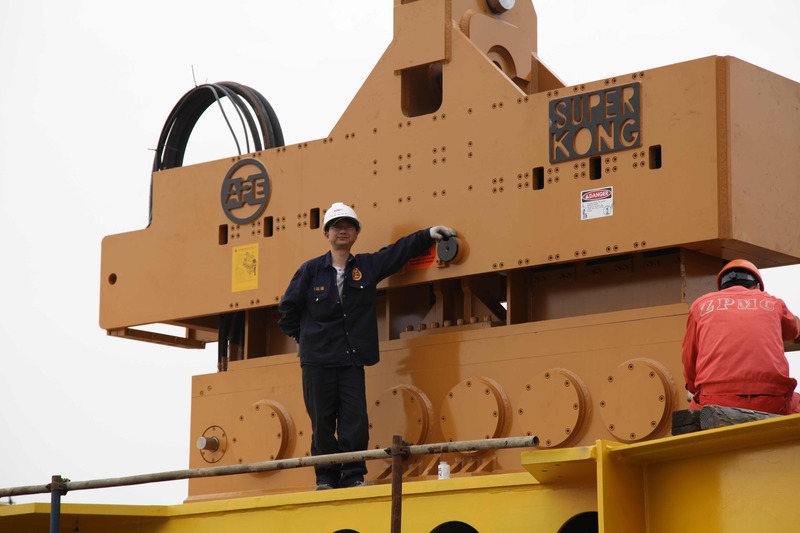 This marks a milestone for APE China and it’s ability to continue to provide the largest hydraulic vibratory hammers to the China market along with local service and manufacturing. 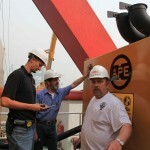 A 1200 HP engine powers the 400 with option to use 1050HP on easier jobs. 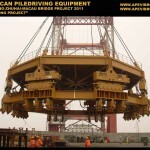 APE China made equipment is only for the Asia pacific region while Kent,WA manufactures for the USA and Europe. 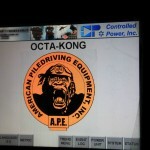 Go APE! 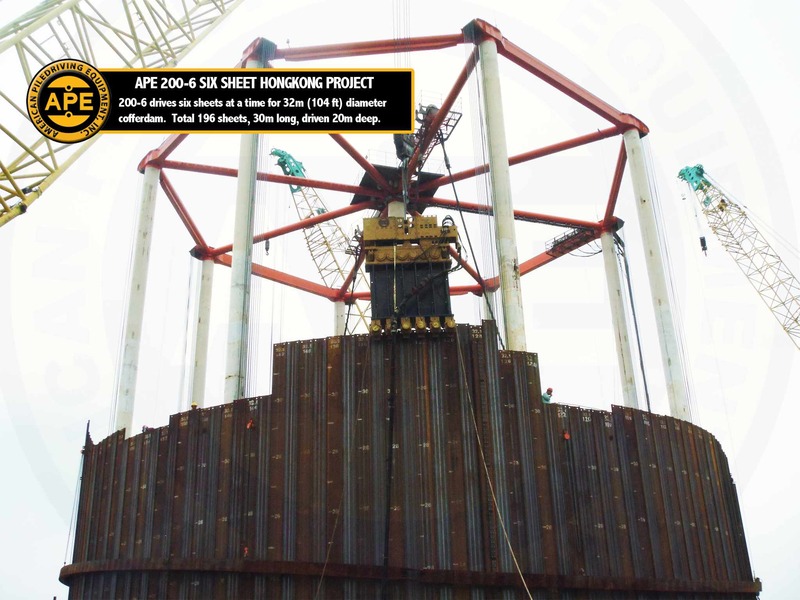 APE’s 200-6 successfully drove six piles at a time for the 32 meter diameter (104 ft) cofferdams that are being used to extend the Hong Kong airport runway. 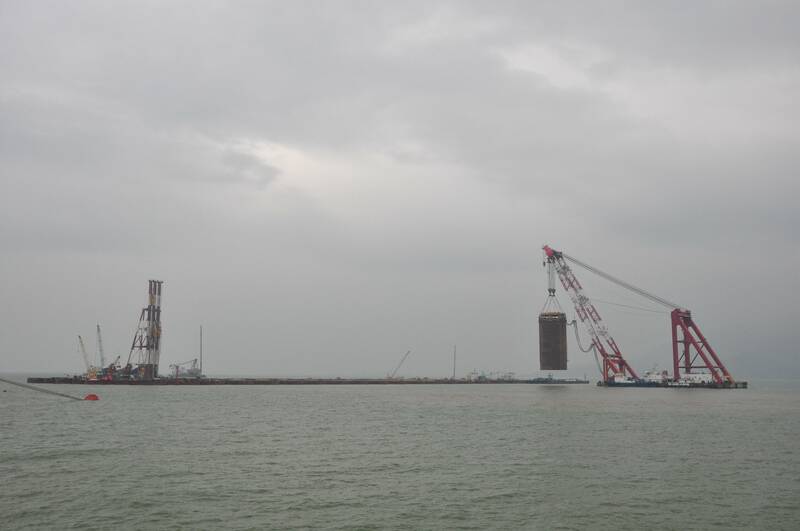 Prior to the project start, the Chinese government design groups had a tough choice between using either 32m (104 ft) diameter super-large piles, similar to the 22m diameter (72 ft) piles driven for the Hong Kong-Zhuhai-Macao man-made island project, or instead to use sheet piles. 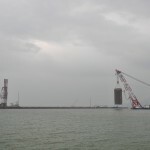 Since the project is next to the Hong Kong airport there are many safety regulations for construction ships in the area. 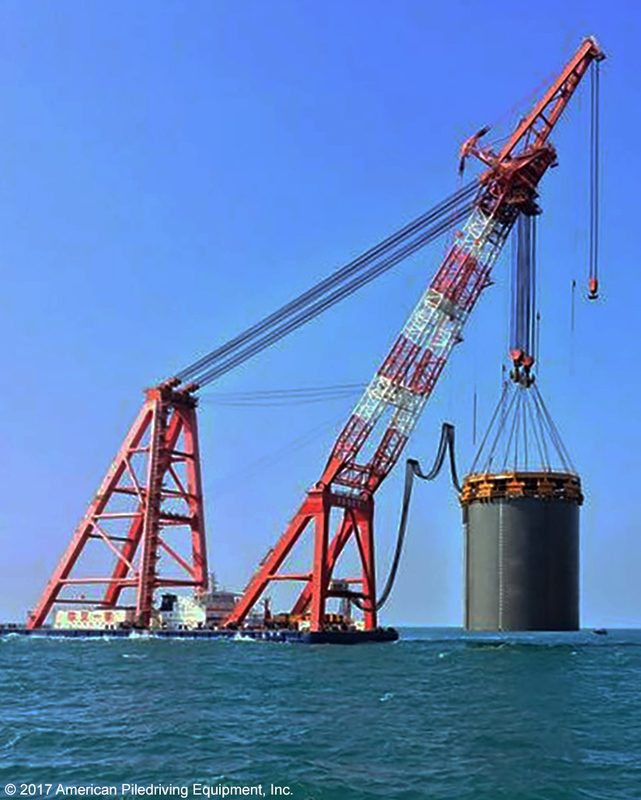 To drive 32m (104 ft) super-large diameter piles would require a 4,000 ton boat crane with mast that would exceed the 35m (114 ft) height restriction of the area. 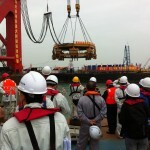 The fear was that if the boat crane was too tall it would be a danger to the airplanes trying to land at the airport nearby. 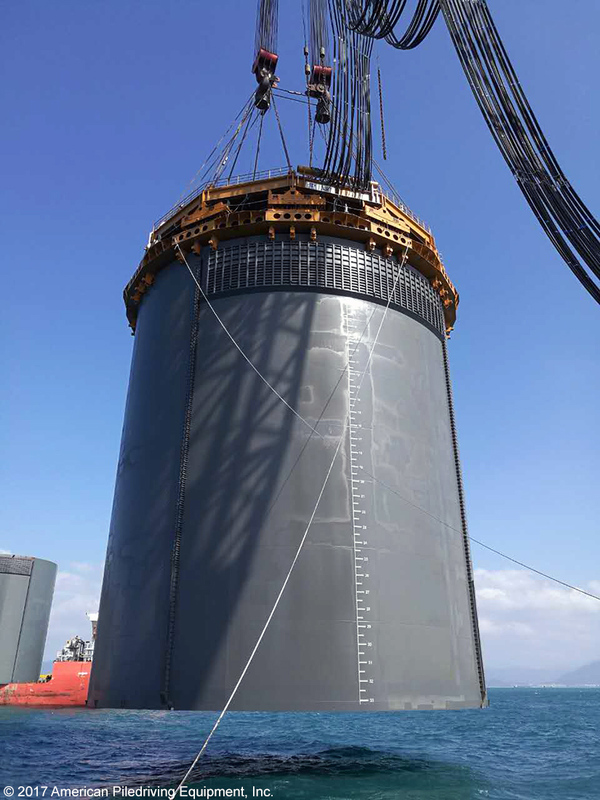 Therefore, despite the success of the “APE Octakong Project” that drove 22m (72 ft) super-large diameter piles just 10 months ago, they decided to use sheet piles to create the 32m cofferdams instead. 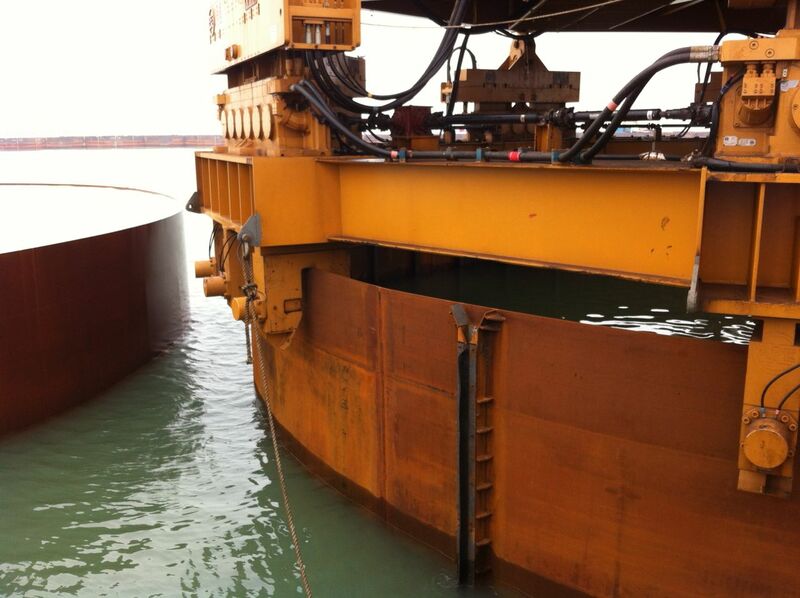 Driving sheet piles for 32m (104 ft) diameter cofferdams on water is no easy task, but despite all of the challenges the main concern was construction speed. 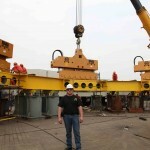 To speed up the project the contractor wanted to drive six sheet piles at a time per hammer, something that again has never been done before on this scale. 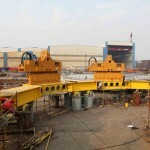 APE provided four 200-6 hammers with six APE model 150 clamps attached to custom beam. 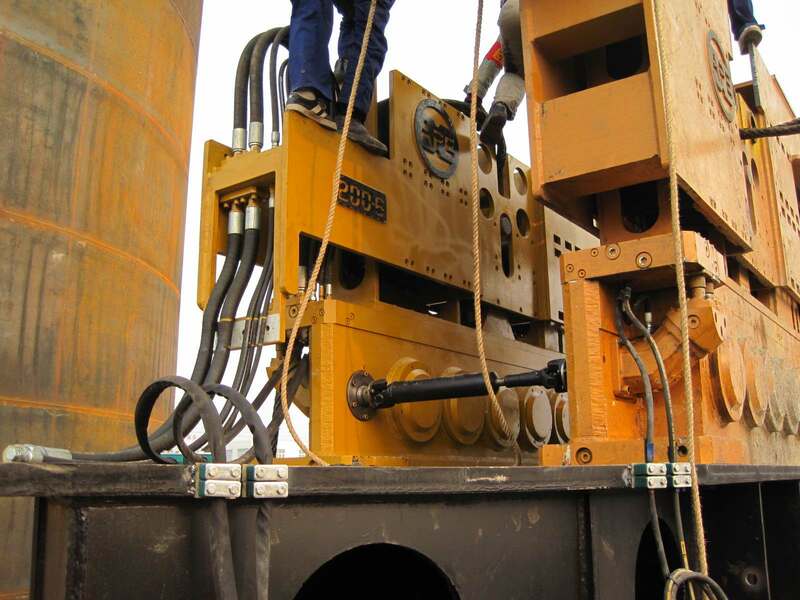 Each hammer has a special manifold that allows independent control of each clamp. 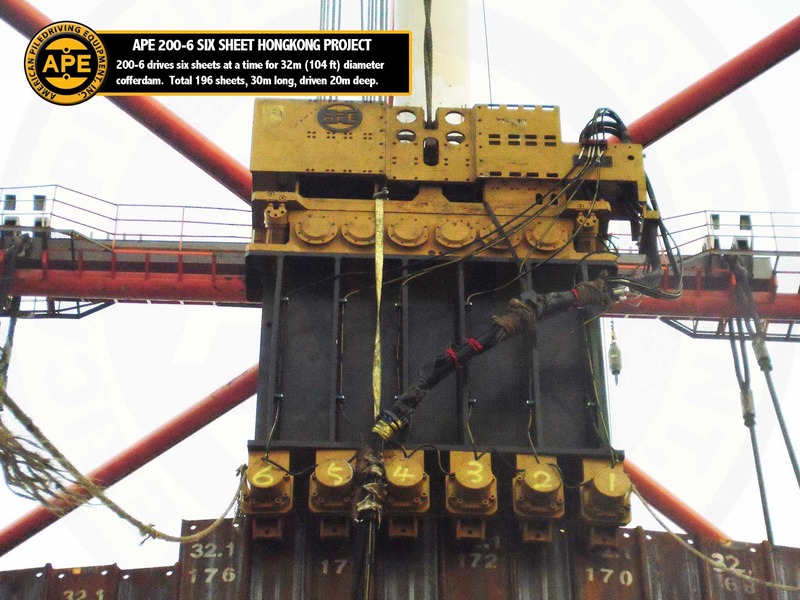 After the sheets are put in place the APE 200-6 hammer is placed on a row of six sheets to be driven, however when sheets are first placed in the cofferdam template they are not all sitting at the same height since some sink in the soil farther than others. 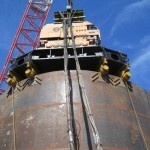 The contractor needed a way to grab onto several piles and vibrate down while some of the clamps are still open. 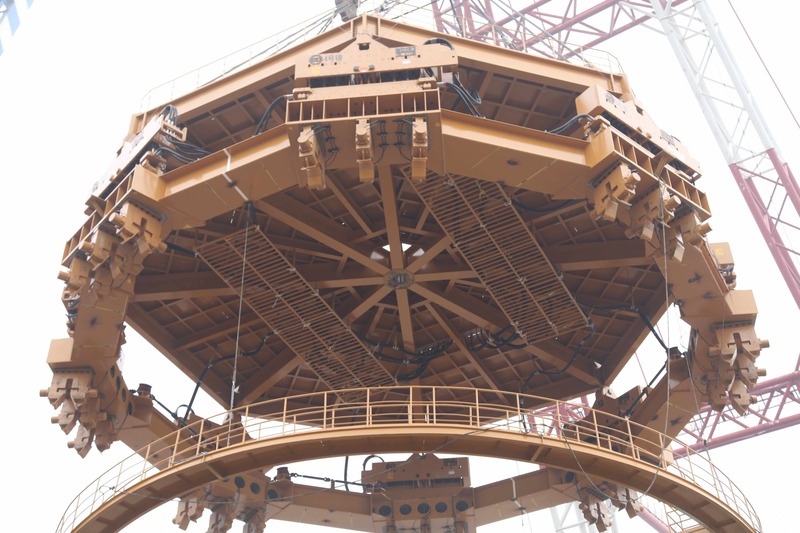 APE changed the design of the clamp slightly to withstand the forces of a vibratory hammer even while some the clamps are in the open position while others are in the closed. 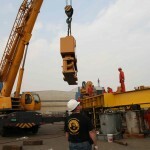 This week the 200-6 was used for the first time with great success. 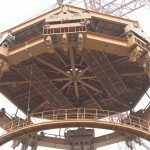 Currently there are now four working 200-6 hammers on the job site each driving six sheets at a time. 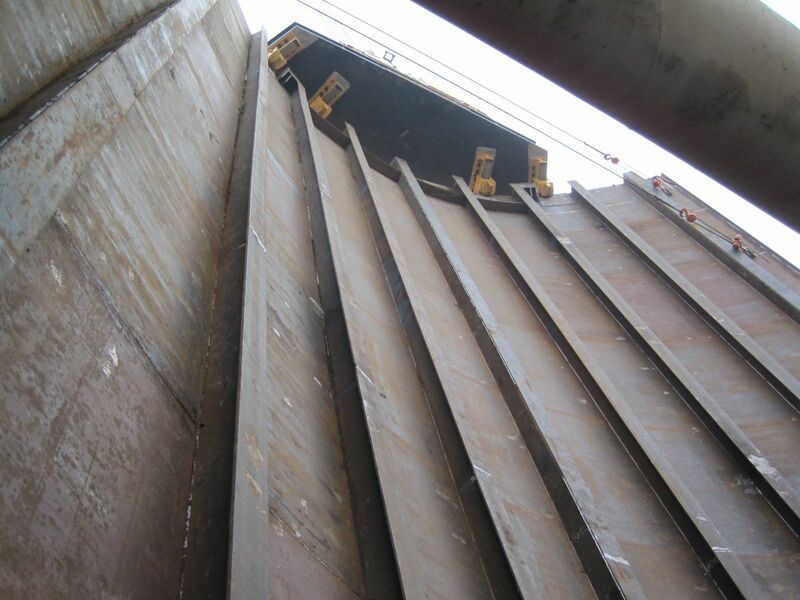 To increase the speed of the placing of the sheets the contractor also designed a special boat that could grab 49 sheets at a time and place them in the cofferdam template; effectively placing 25% of the sheets at once. 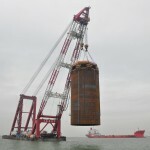 A special barge was created to pre-place sheet piles in a position that the special crane could grab. 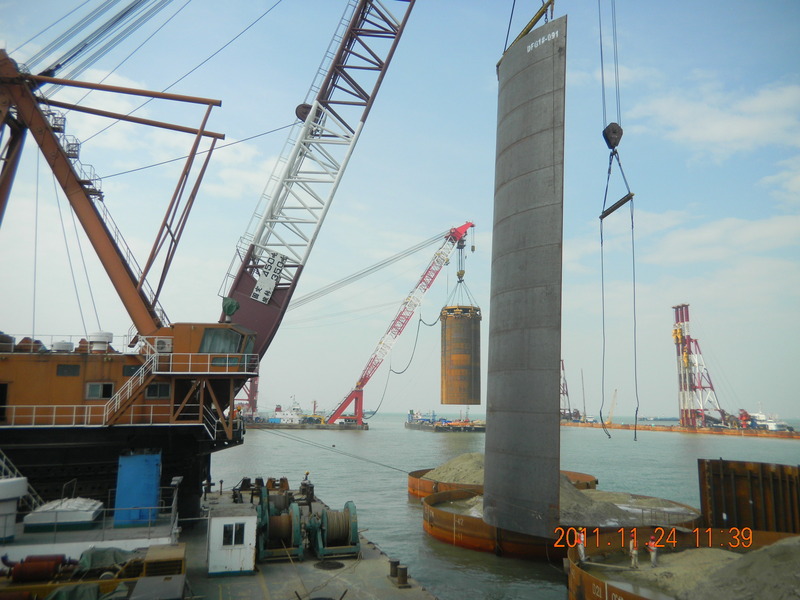 The project requires 147 cofferdams to be driven with 196 flat sheet piles per dam. 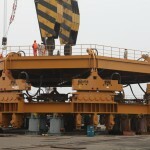 Each sheet is 30m long to be driven 20m deep. 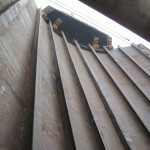 One cofferdam can be fully driven to grade in 4-5 days, a speed unattainable without modified equipment and unique construction techniques used. 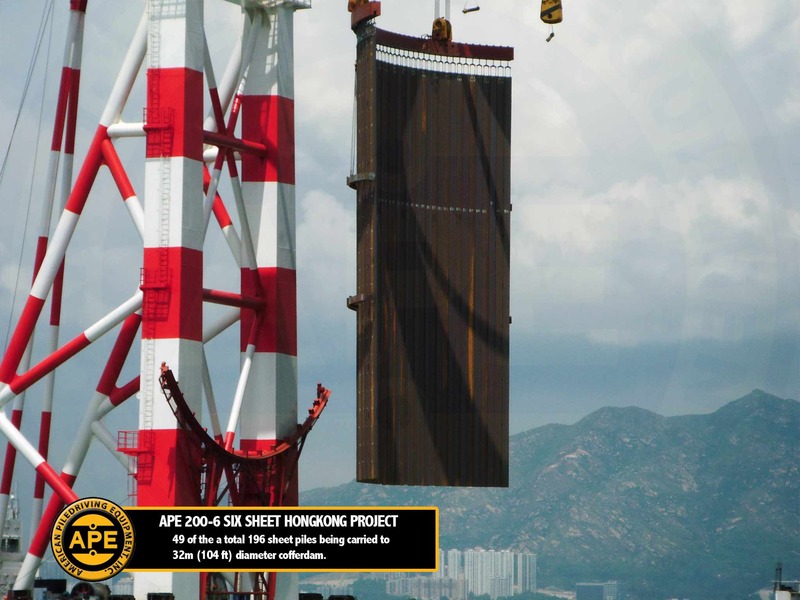 This project demonstrates the cooperation APE has had with the Chinese government to continue to supply pile driving equipment that meets their ever increasing construction speed requirements. 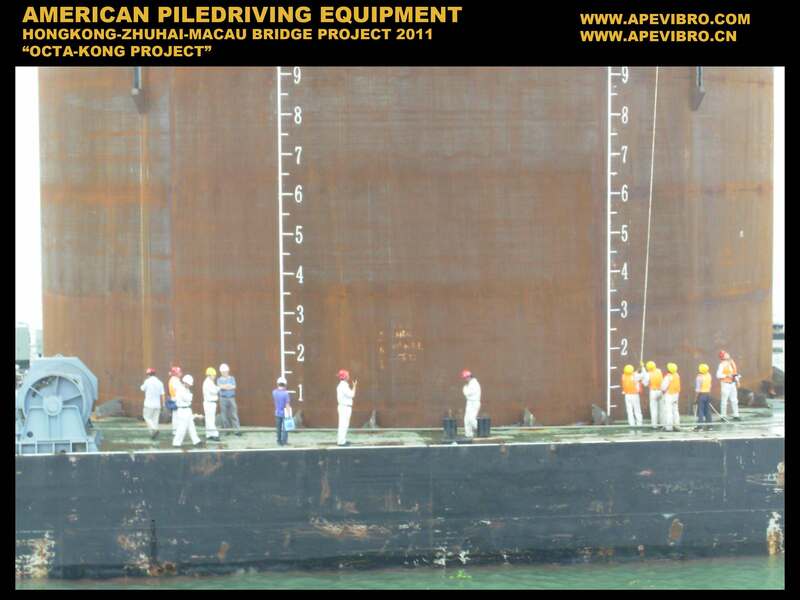 For more information on this project please contact our commercial lead Steve Gough (steveg@apevibro.com) who has worked closely with the project groups leaders, or our technical lead David White (davidw@apevibro.com). 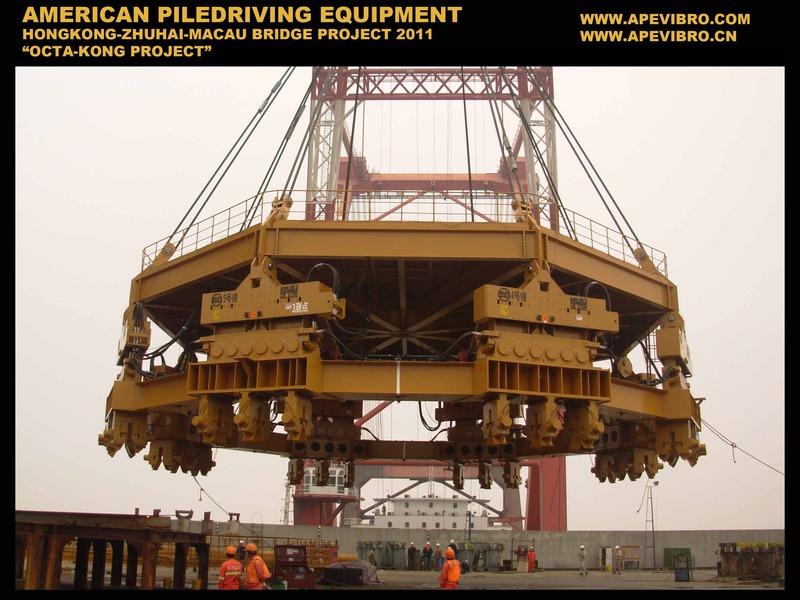 Both Steve Gough and David White speak fluent mandarin Chinese and are well versed in pile driving lingo, feel free to contact them in either language. 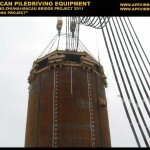 For more pictures of this project please visit our website at www.apevibro.com. 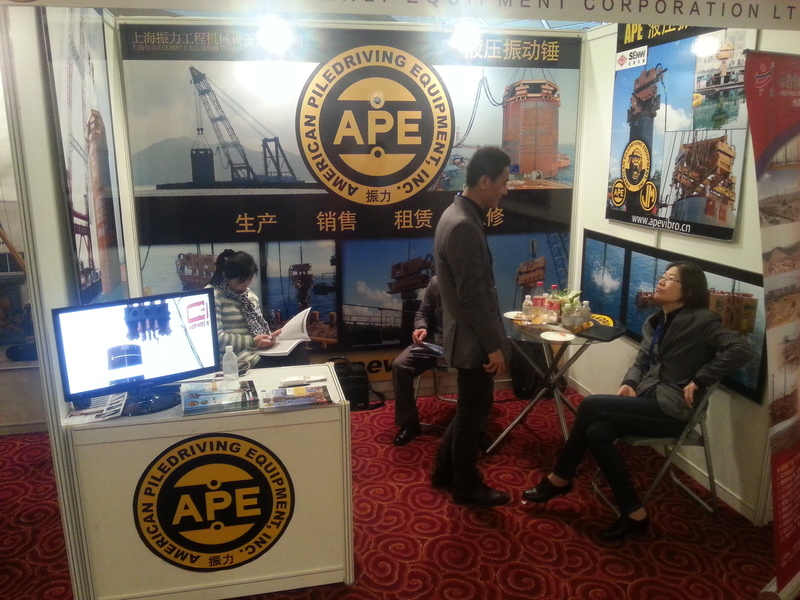 Go APE! 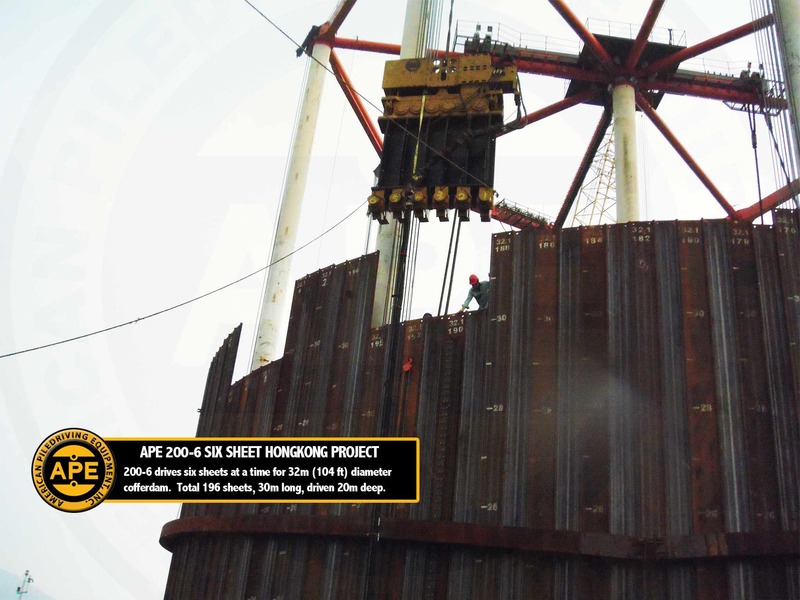 The “APE OctaKong” project revolutionized the way cofferdams could be driven at sea when it drove 120 piles at 72 foot in diameter to grade in 6 months. 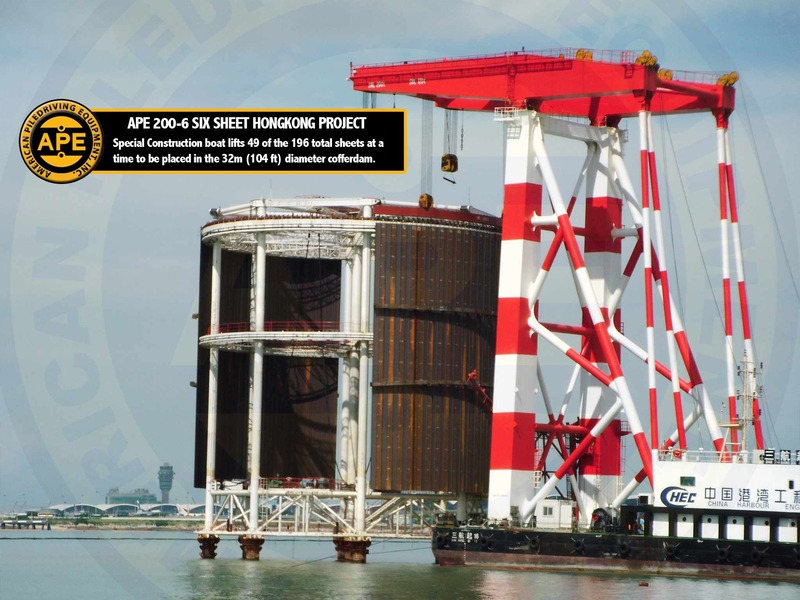 The “Tandem 200-6 Special” project revolutionized the way cell walls could be driven when it drove 240 single cell sheet walls at 37 foot wide. 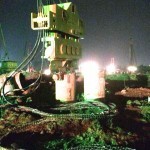 Now another revolution is taking place; Underwater soil compaction. 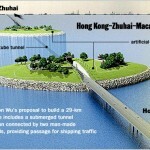 In between the two man-made islands for the Hong Kong Macao Bridge will be a 5,000m long tunnel. 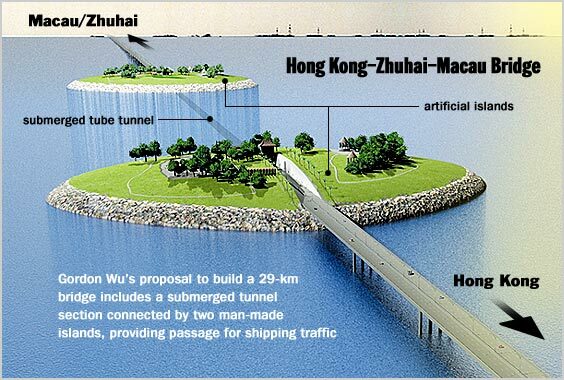 To build the tunnel they will use pre-made concrete sections that will be lowered onto the sea floor. 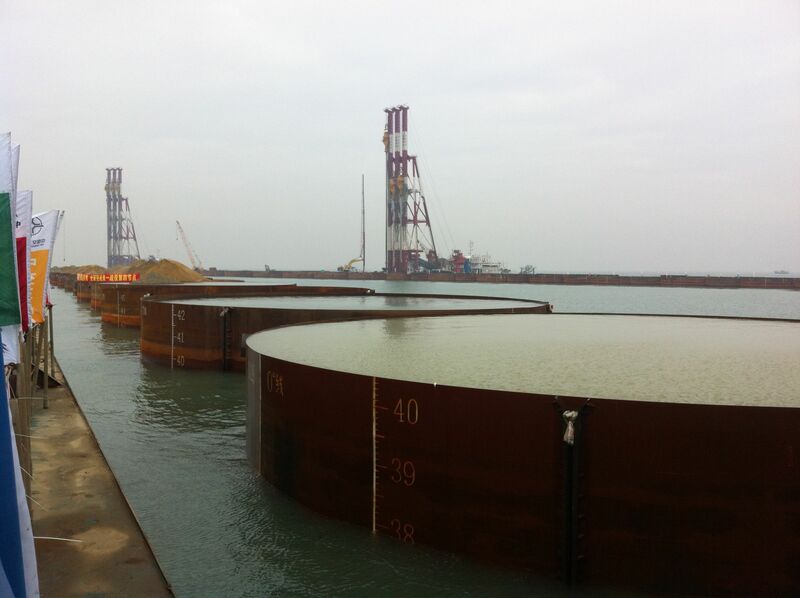 Once all the tunnel sections have been lowered into place the water will be pumped out and a tunnel will be created. 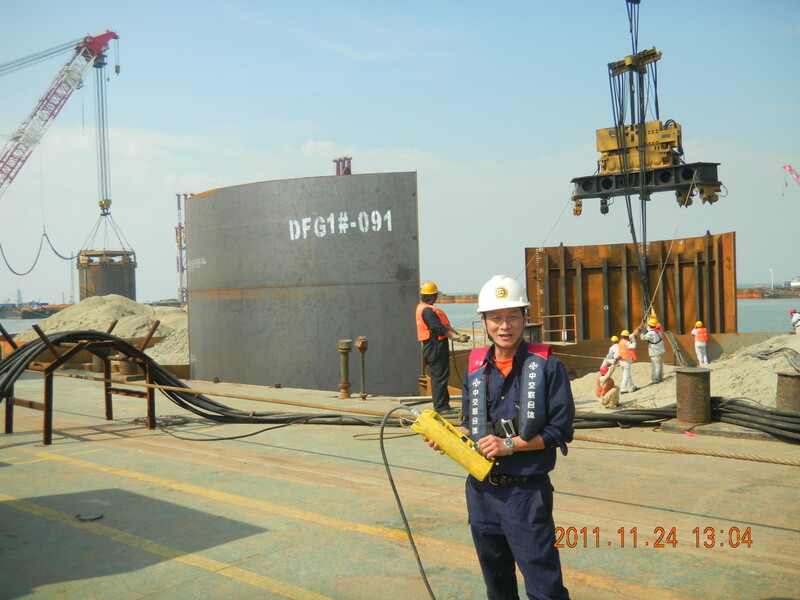 However, before the tunnel sections can be lowered down on the sea floor the ground must be hardened and flat. 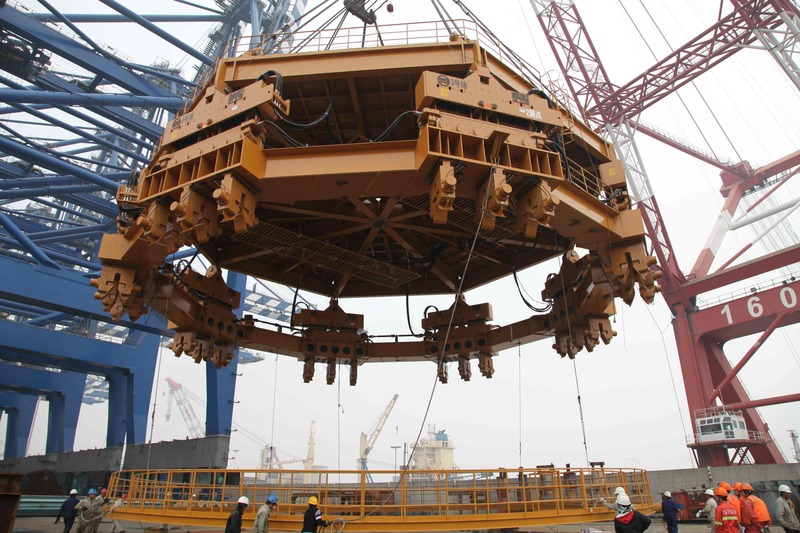 Traditional methods would required a large weight to be repeatedly dropped onto the gravel below until the ground is hardened to the required level, but when compacting soil at sea the accuracy of dropping a weight can be slow and tricky. 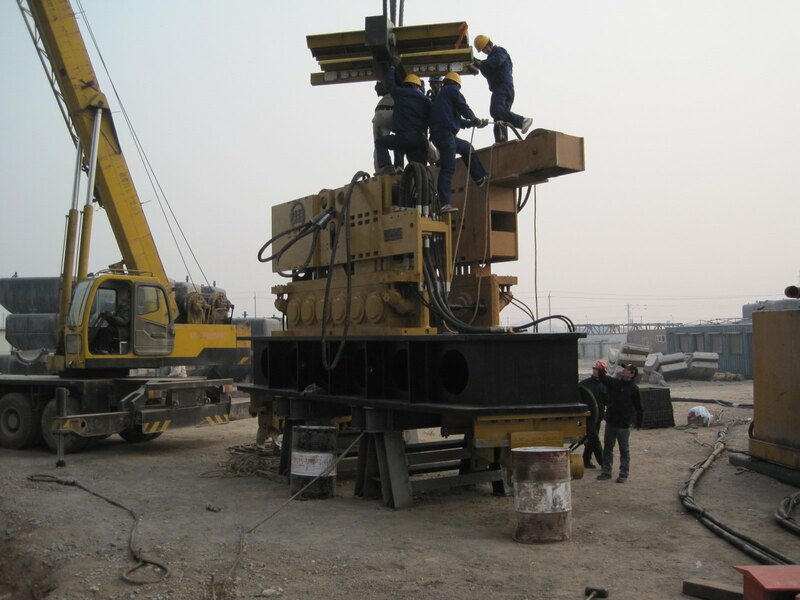 Therefore, a method was created to use a 40 ton steel plate, that looks like a big clothing iron, connected to a single APE model 600 vibratory hammer. 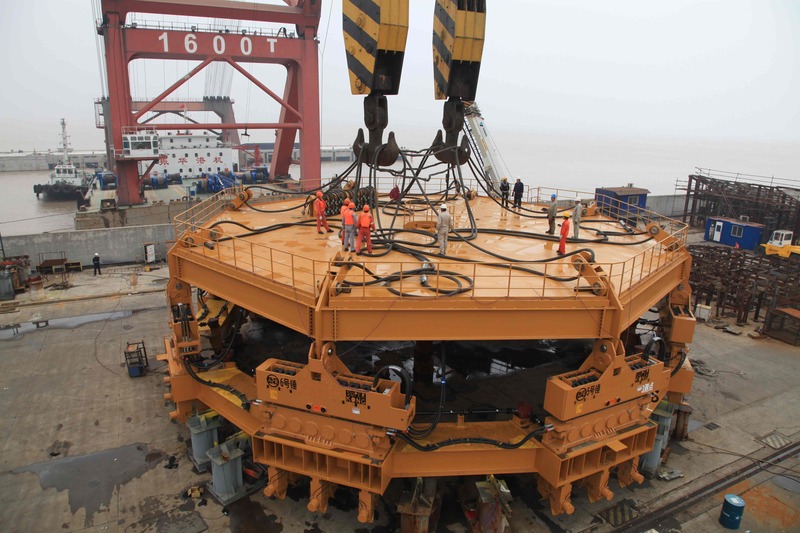 After the gravel is poured on the ocean floor the APE 600, using 550 tons of driving force, compacts the gravel to near perfect flatness. 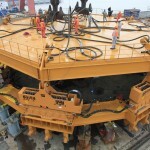 Much like ironing a wrinkled shirt, the sea floor is ironed out. 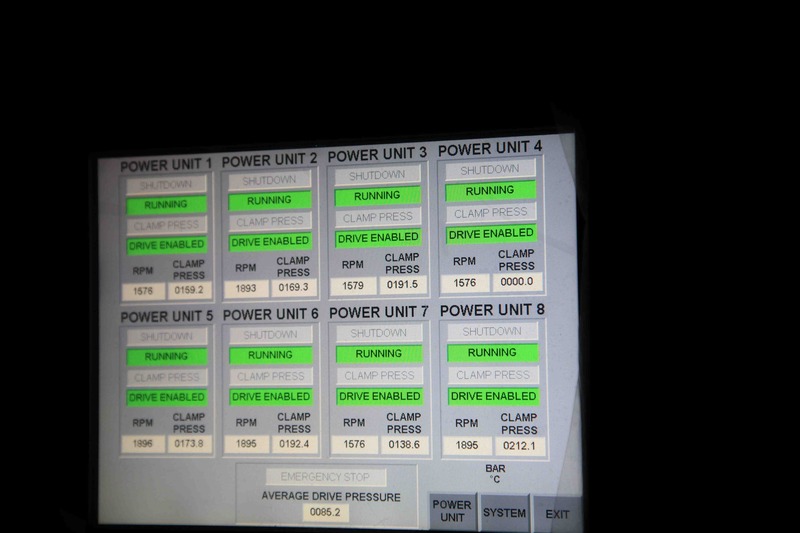 The only difference being that its down 50m underwater in complete darkness. 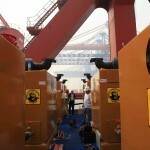 With special sensors and GPS devices the APE 600’s location is known by operators of the ship above, even during continually changing currents. 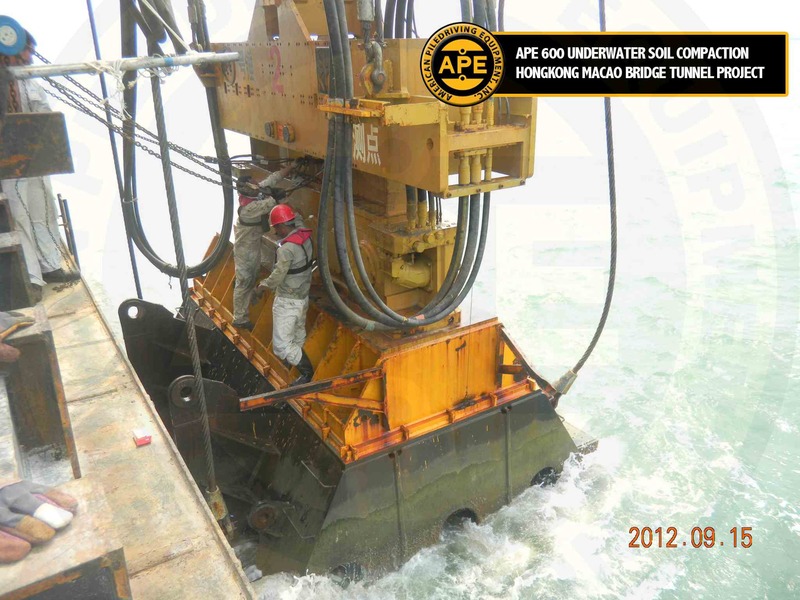 APE’s hammer are known to have underwater capabilities far superior to other vibratory hammer models in the market, but this job requires the hammer stay underwater for 4-5 days at a time at 50m deep working 24 hours a day. 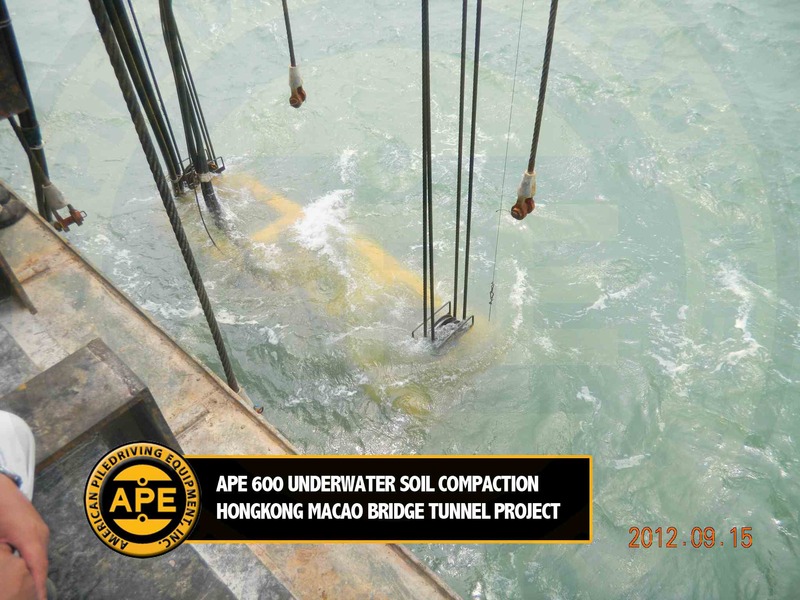 This would be the most rigorous underwater job ever done using APE equipment and the engineering limits of the APE 600 again would be tested, especially because the project will be 18 months long. 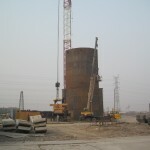 After 1 month of operation the project has been a complete success. 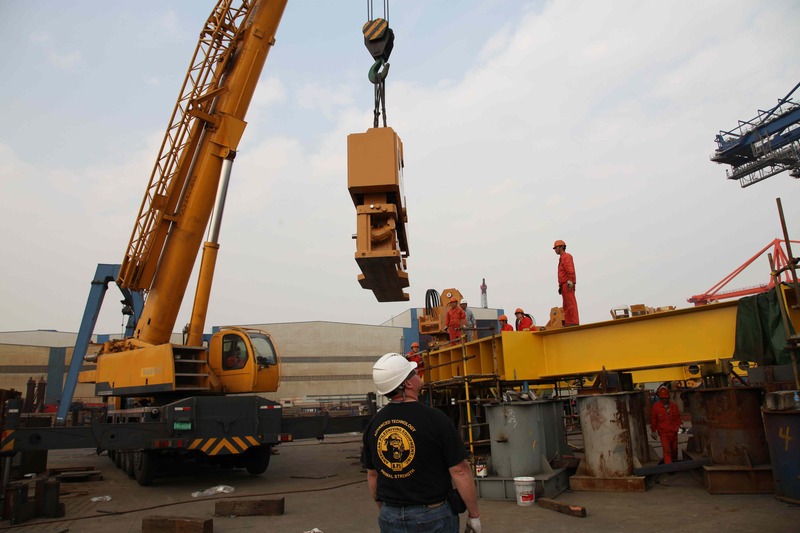 Today the 600 was pulled out of the water after it’s fourth 5 day dive and all indications show zero seawater entered the gearbox and all systems normal. 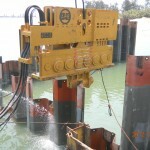 We hope to see more contractors using this method in the future for underwater soil compaction jobs in the future. 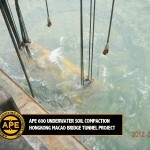 For more information of this project or information on underwater pile driving please feel free contact David White of APE China. 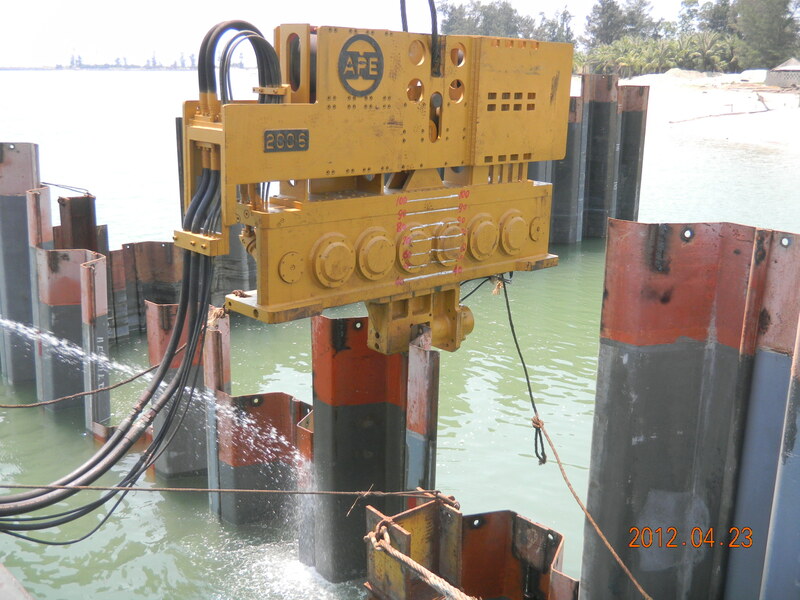 The APE 200-6 was recently rented to an experienced customer in HaiKou to drive double “Z” shaped sheet piles for a new dock project. 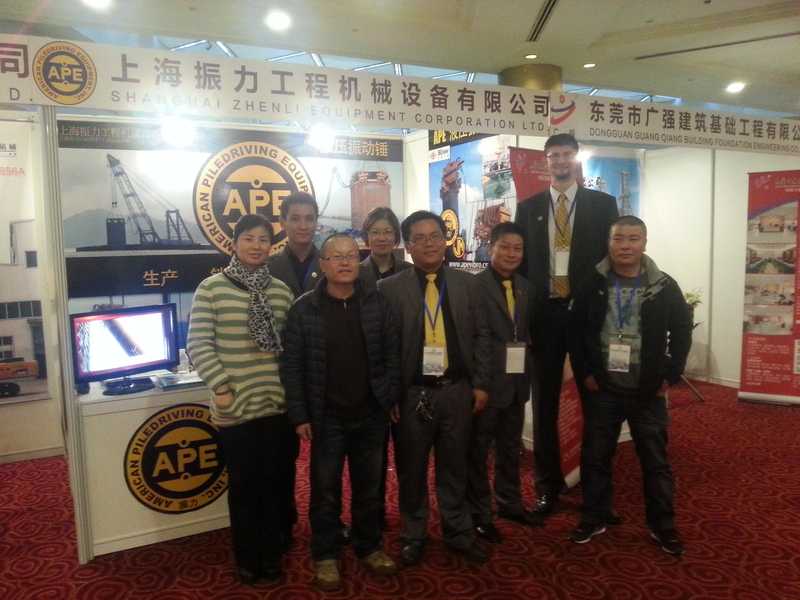 Convincing new customers in China that APE equipment is of the highest quality available is never easy. 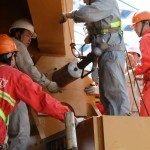 Many years of competition in the market selling fake products, low quality products, and terrible service has left most contractors extremely weary to trust anybody. 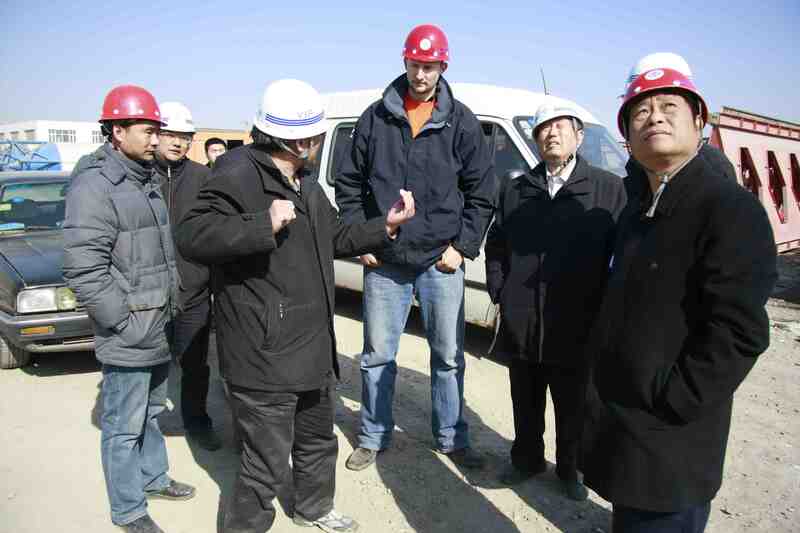 Even as a Tall 2.1 meter tall white speaking foreigner in China, it is not enough to fully convince contractors that our product and service is far beyond anything they have experienced in the past. 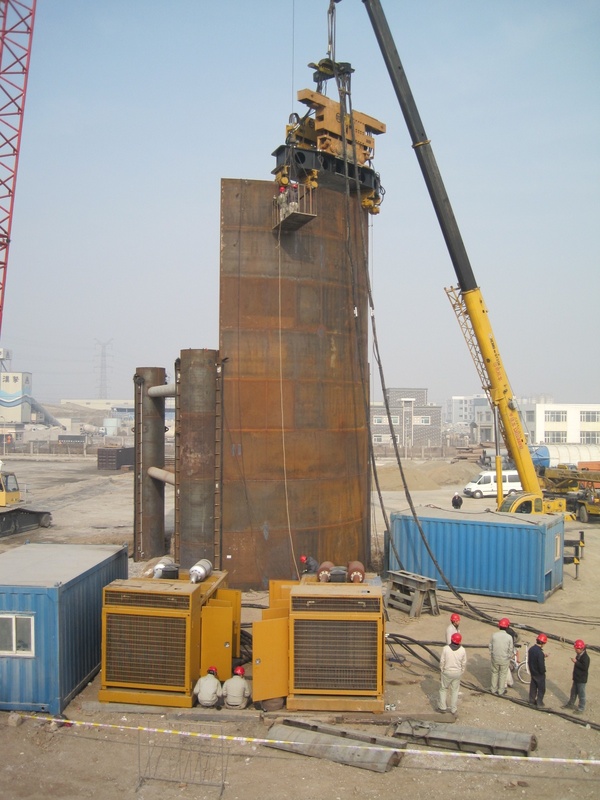 This particular customer has either purchased or rented at some point every single vibratory hammer in China available from electric to hydraulic and local to import. 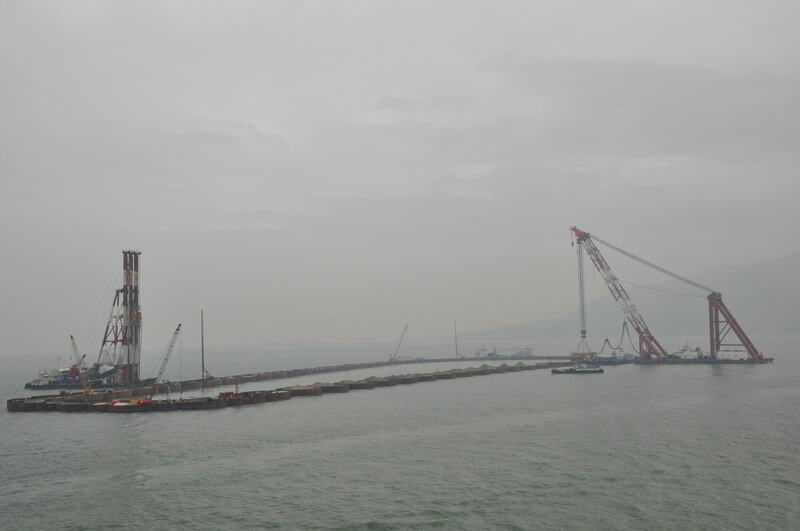 Due to the extreme success of the “Octa-Kong” project for the HongKong-Macao-Bridge project to drive 22m (72 feet) diameter piles he decided to give us a chance. 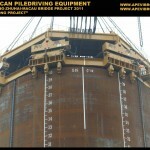 He figured that if we can drive 22m (72 foot) diameter piles we should be able to drive sheet piles. 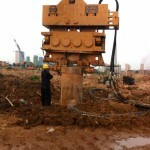 24 hours prior to us receiving a down payment for a few months rent he received all call from our competitor saying he was making a grave mistake to rent our hammer to him and APE hammers would absolutely not succeed in driving the sheet piles to grade. 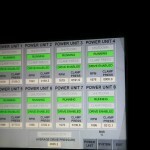 Our customer called me on the phone and said he was extremely disturbed by the call. 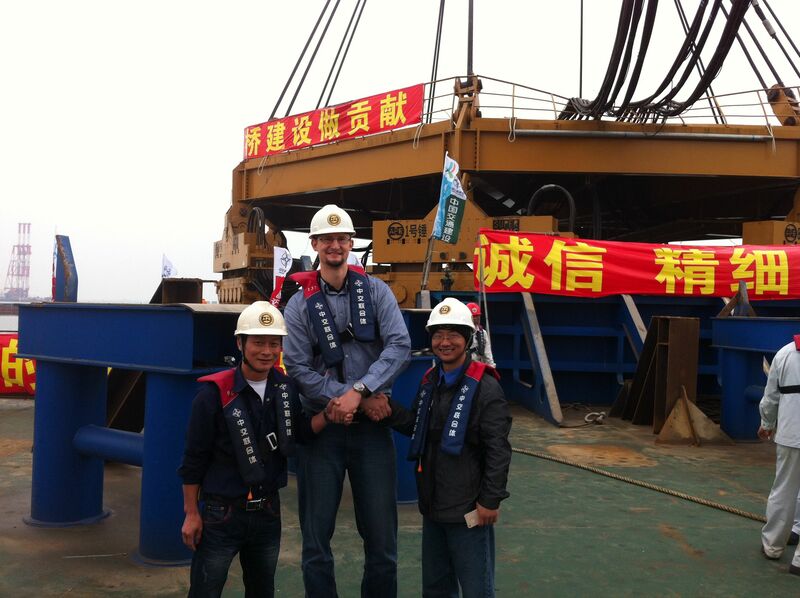 Dan Collins and John White has told APE CHINA several times to rent our hammer for free if we have to prove to the market that we have the best product. 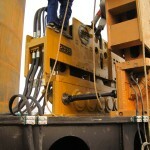 I told the customer we would return 100% of the money if our hammer didn’t drive the sheet piles. 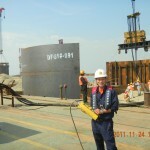 He was so moved by what I said he said he would send 100% of the money within 20 minutes, he did without any extra modification to the contract. 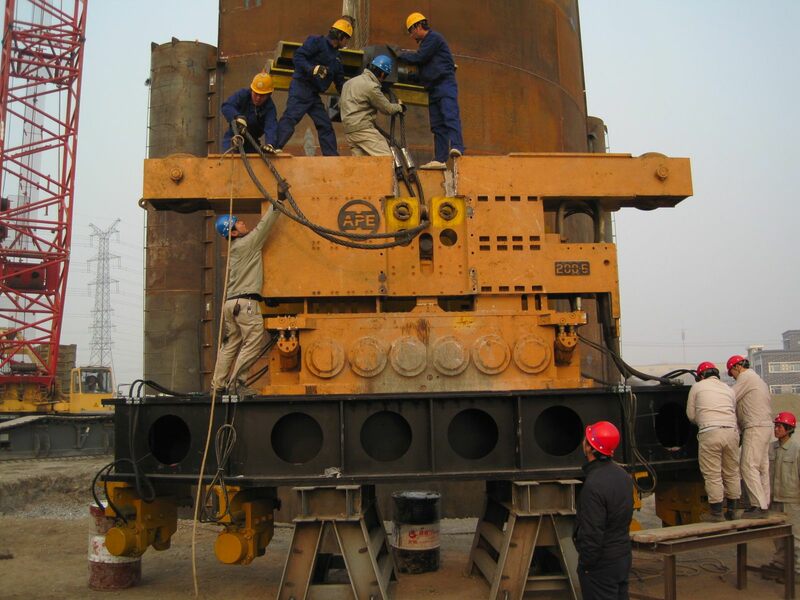 After the hammer arrived on the job site our service man Mr. Liu discovered that all of our engine oil from our Cummins 700 HP engine was gone. 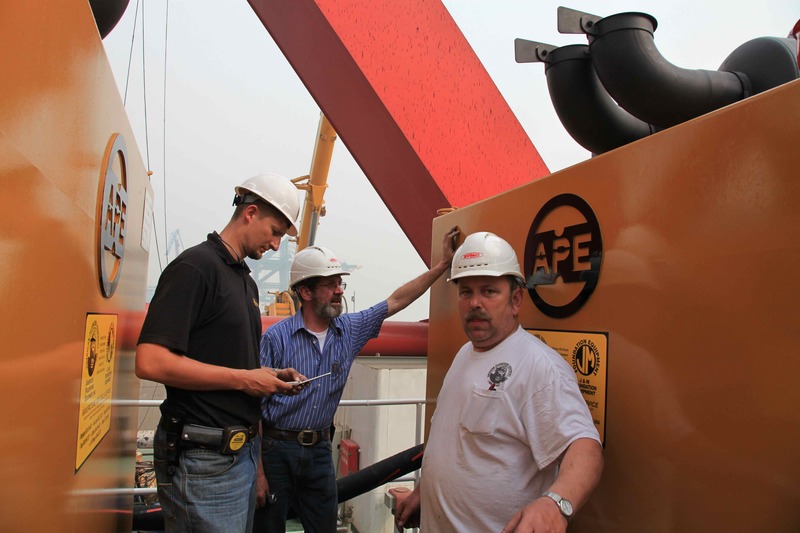 We all remember quite clearly doing a full service check of the machine prior to shipment and were shocked to discover that all of the engine oil was mysteriously gone after the first night on the job site. 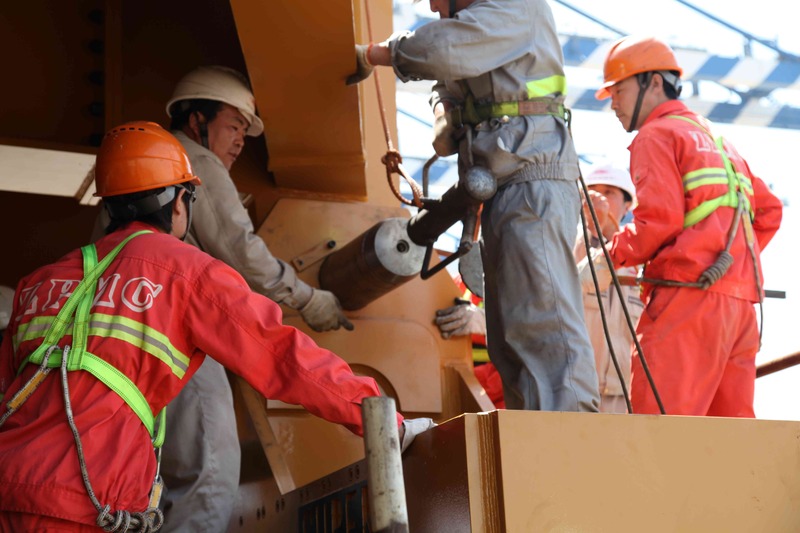 Mr. Liu, being the excellent service man he his, checked all fluid levels prior to initial startup of the power unit of the drive pump lube oil level, hydraulic oil level, radiator fluid level, diesel fuel level, and thank goodness the engine oil level. 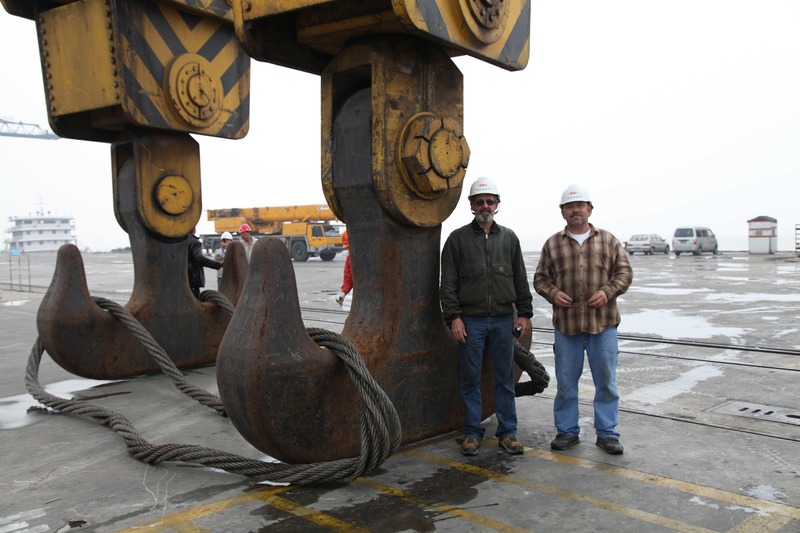 After a wasted half day of replacing the engine oil, which we paid for, the hammer finally had the chance to prove it could work. 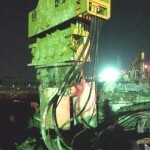 The hammer ended up doing extremely well on the site driving 15 to 20 piles per day easily. 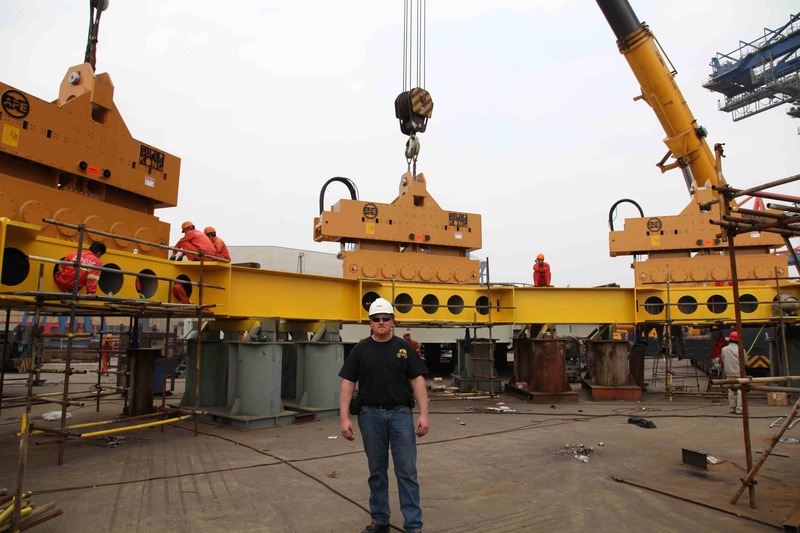 Our customer was so happy with our service he wrote a full-page hand written thank you letter to our service man Mr. Liu and to APE for the excellent service given on the job site and high performance of the hammer. 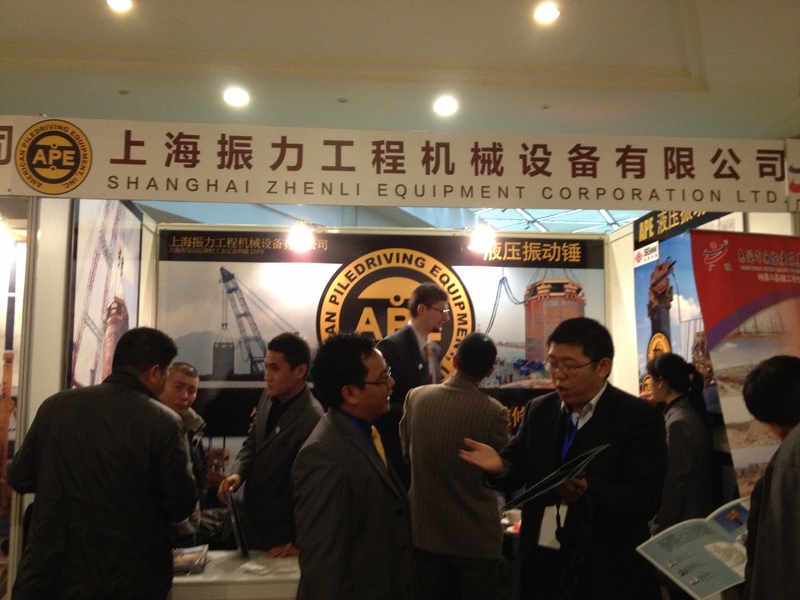 We are extremely happy to represent a product we all believe in, there’s nothing better than selling a product that you know is going to work. 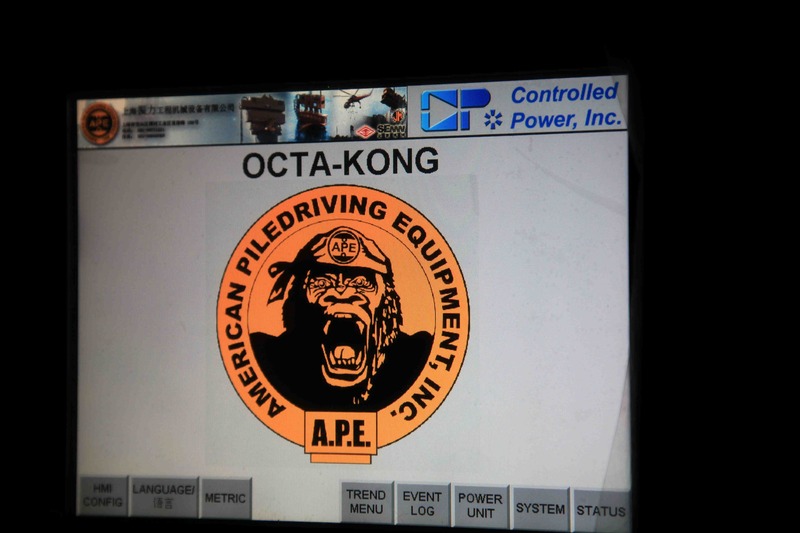 Go APE! 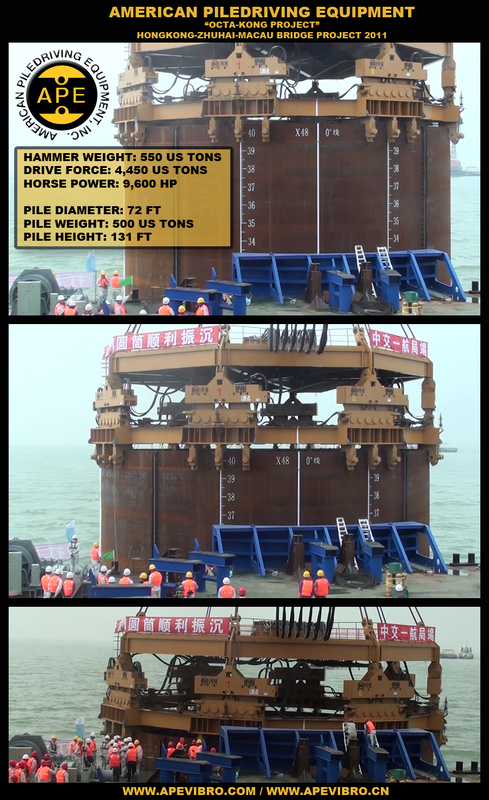 On December 8th 2011, the APE “OctaKong” hammer drove it’s final pile to grade in front of a crowd of 200 people on the South China Sea. 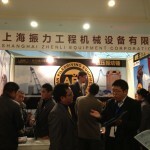 Many Engineers, officials, contractors, and China T.V. 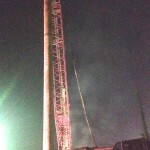 Stations came to witness the final pile drive to grade. 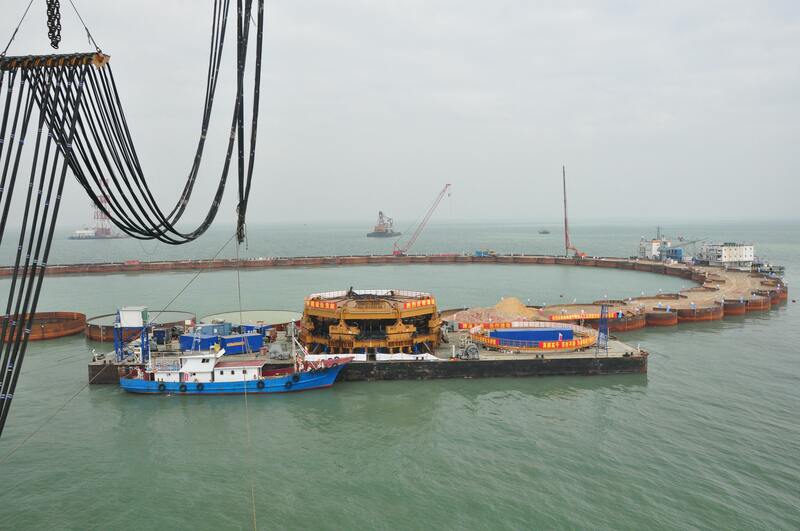 In total, 120 piles were used to create the east and west man-made islands for the HongKong-Zhuhai-Macau bridge project. 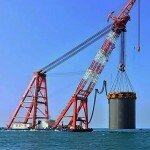 The largest pile was 72 feet in diameter, 180 feet high, and 660 US tons. 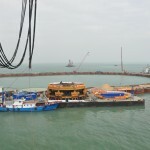 The entire project lasted just under 7 months, an incredibly fast time to make two full island foundations. 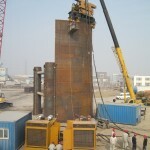 ZPMC, the Shanghai based company who fabricated the piles, could hardly keep up pile production with the driving speed of the project. 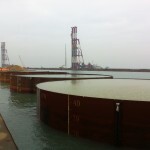 At the fastest point the OctaKong drove 6 piles in 3 days. 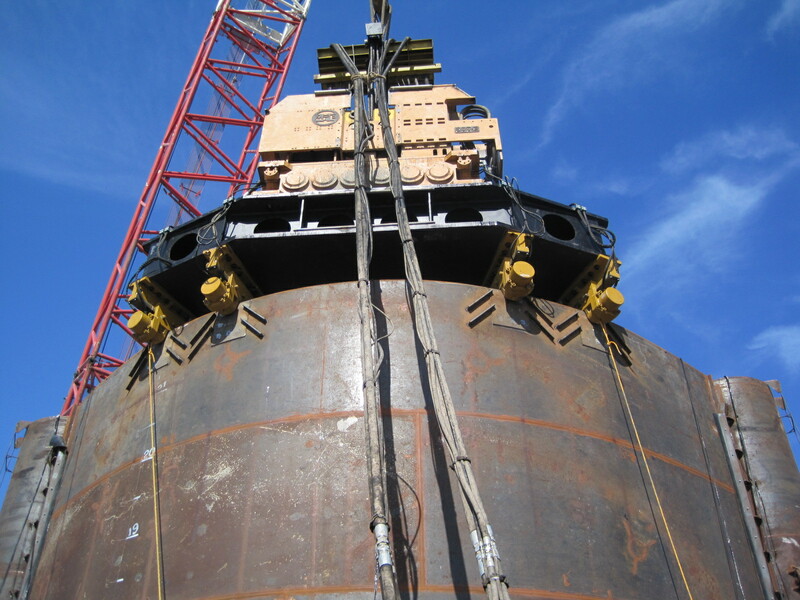 One of the biggest challenges of the East island was learning how to drive 72 foot diameter piles in complex soil conditions. 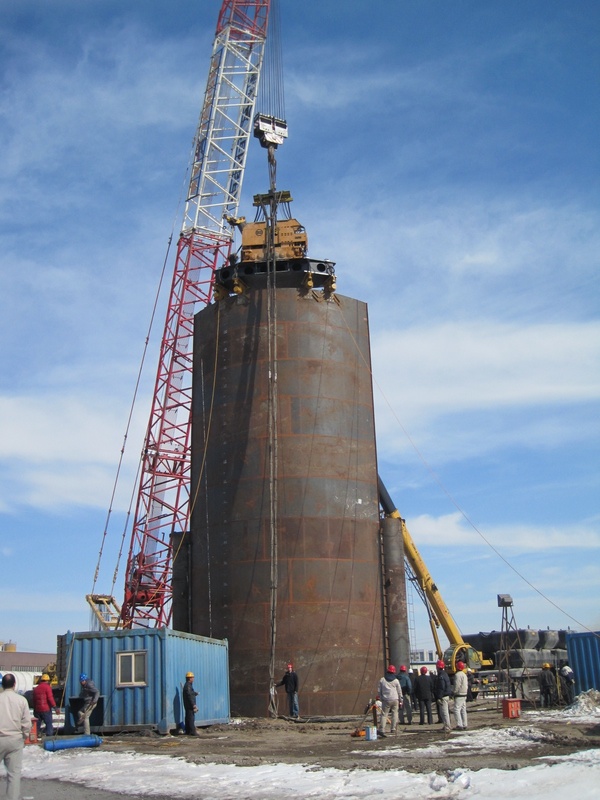 When driving large diameter piles the soil conditions on one side of the pile can be very different than on the other side of the pile. 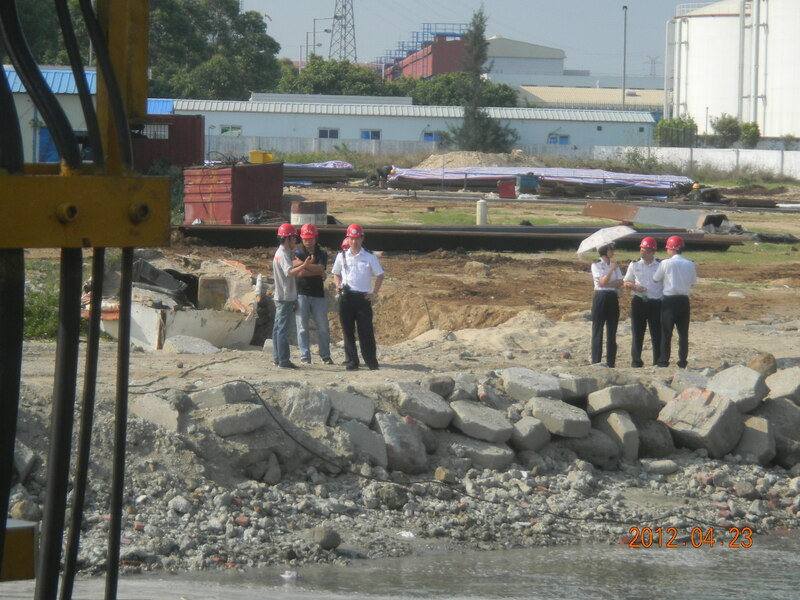 At some points the right side of the pile was facing N47+ soil while the left side only saw only N15. 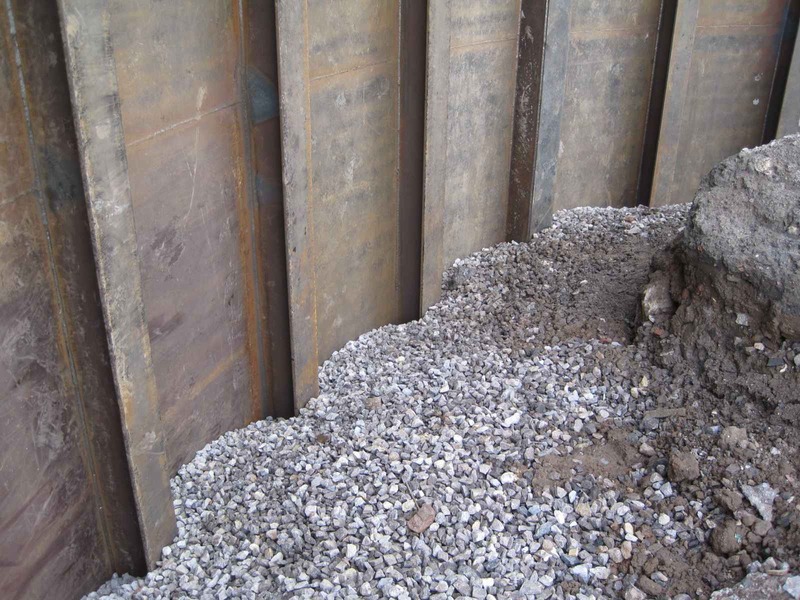 Soil layers are not flat, which is not usually not a problem when driving small diameter piles, but when faced with super large piles often times one full side of the pile will cut through a soil layer for 10 feet before the other side of the pile hits the same layer. 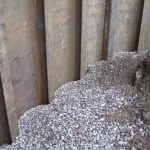 This creates a big challenge when trying to get the pile to go into the soil perfectly straight. 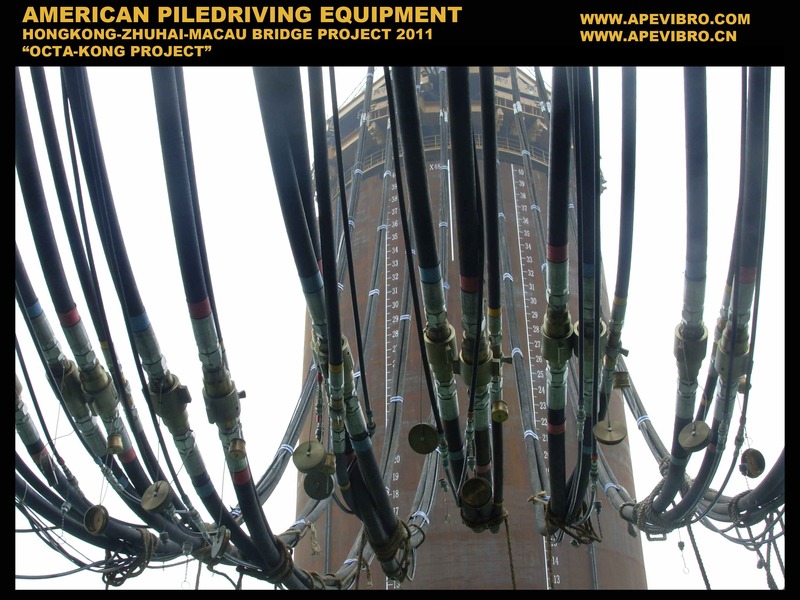 These new challenges forced us to learn a new pile driving method specific to large diameter piles. 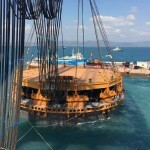 No doubt a huge step for the pile driving industry for the future of even larger bridges, land reclamation, and wind power. 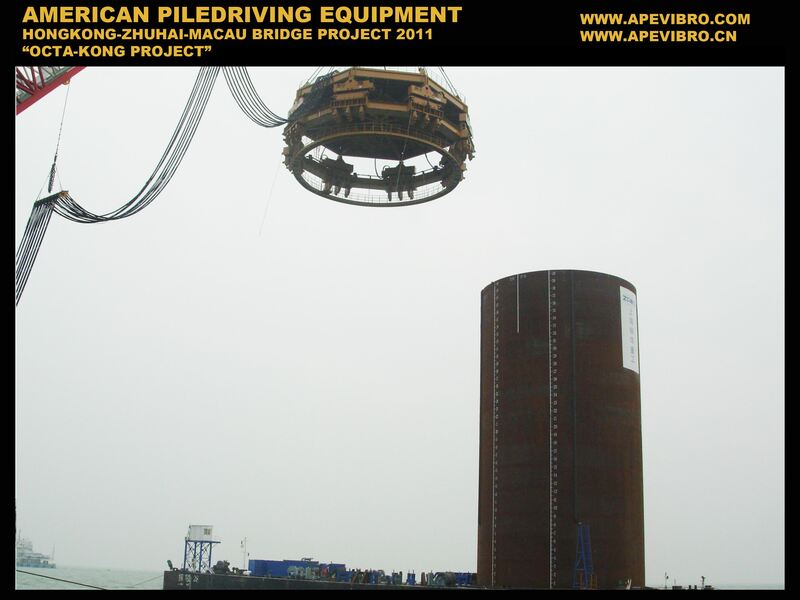 It was a surreal feeling to watch the last pile go into the ground after nearly 2 years of research and planning. 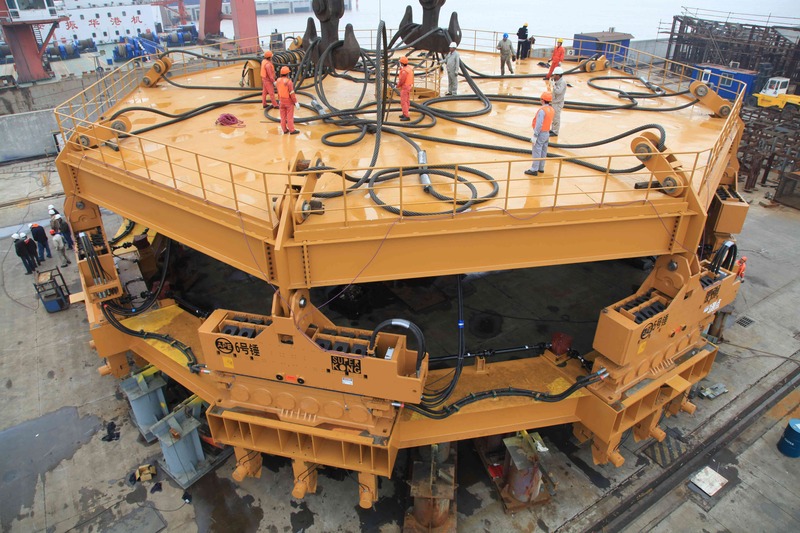 As the pile reached it’s final feet many surrounding boats launched fireworks and large cheering could be heard as soon as the machine was shut off. 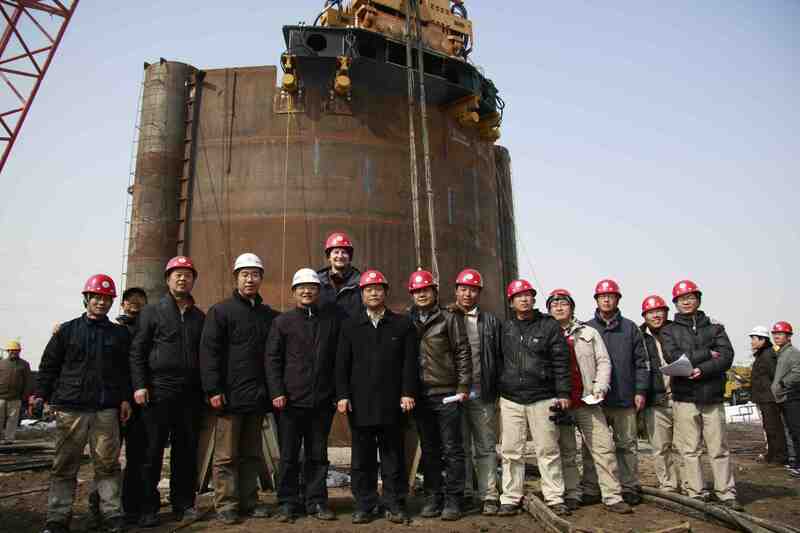 It’s not very common in Chinese culture to see grown business men and engineers hugging and shouting, but as the OctaKong drove it’s last few feet I think it sent overwhelming joy throughout everybody who’s worked on the project, including myself. 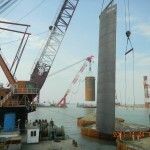 The timeline for this project was so tight that tensions were high for the last 7 months. 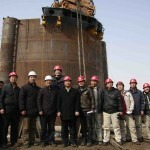 I think everybody knew that if the OctaKong hammer broke for whatever reason the entire project had no chance to finish on time, and with no backup hammer, APE China felt the heat to make sure the project kept going smoothly. 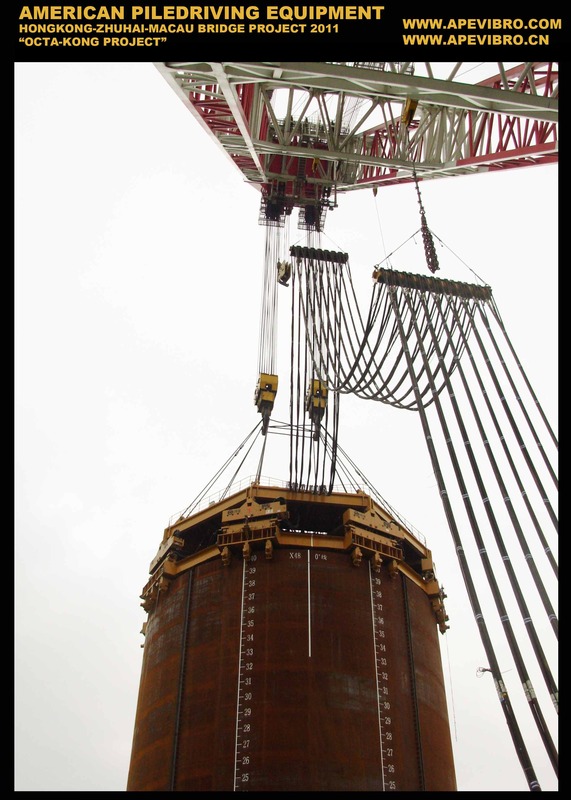 I’m glad to report that the OctaKong hammer never had even one day of downtime, something our APE team should be very proud of. 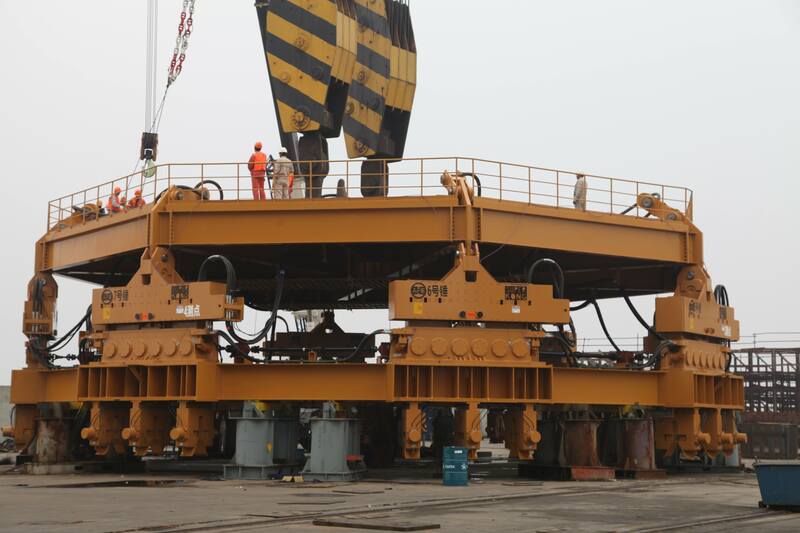 The APE 200-6 tandem special is driving the final 37 foot shell-pile-walls over the next week and that project should conclude soon as well. 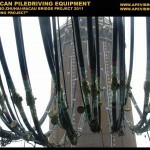 Thank you to everybody who worked so hard on this project! 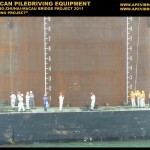 We are working on a 30 minute documentary for this project with some pretty amazing video and pictures. 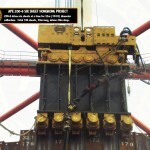 Please stay tuned for that to be released soon! 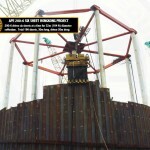 APE Drives the World’s Largest Pile! 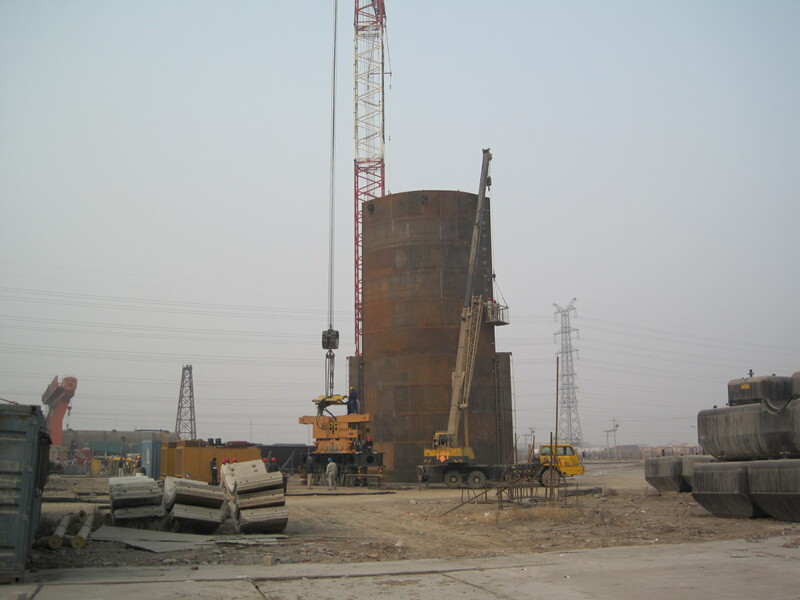 On Sunday, May 15th 2011, at 5pm the world’s largest vibratory hammer drove the world’s largest pile in 7 and a half minutes! 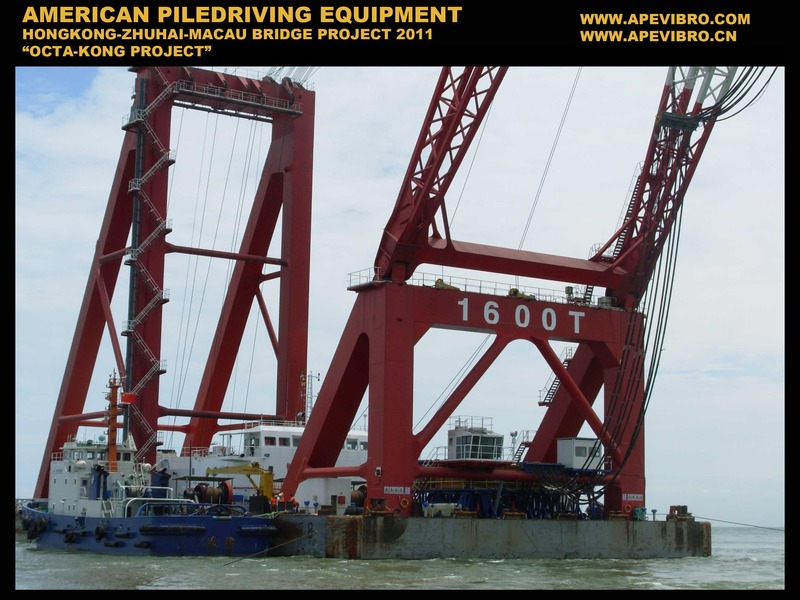 American Piledriving Equipment, Inc with cooperation with First Harbor Engineering Communications Bureau drove the first pile for the East island for the Hong Kong-Zhuhai-Macau Bridge. 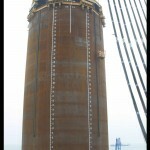 The first pile was 72 feet in diameter, 131 feet tall, and 500 US tons. 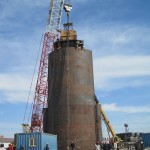 The first pile took about 3 hours to place into the exact correct position. 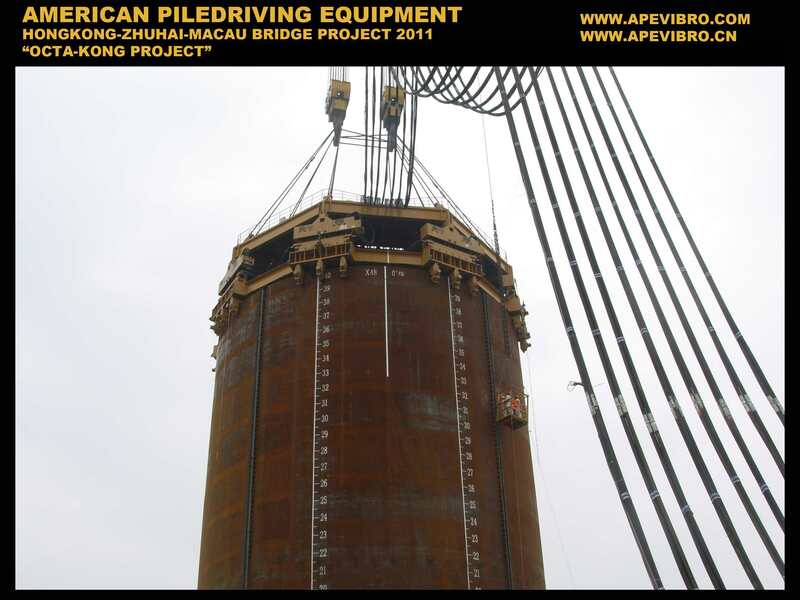 The difficultly level of the placement was due to the fact that not only did the pile need to be in the exact correct GPS location, it also needed to be face the correct degree to line up the interlocks on each side of the pile. 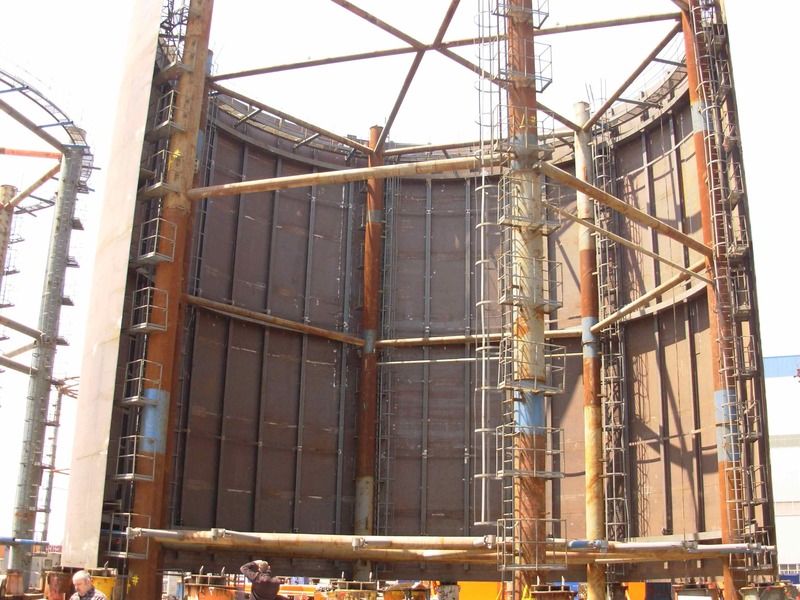 Later this week the first 37 foot wide shell-pile-walls will be driven in between two of the 72 foot diameter piles. 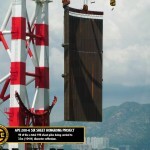 Tensions were very high for the last week as many preparations were needed to get ready for Sunday’s main event. 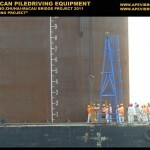 Over 40 top engineers participated in the coordinating of the driving procedure. 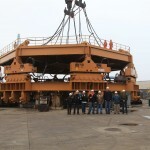 Everybody was separated into many different teams with a total of 60 people involved directly to making sure the first pile drove successfully. 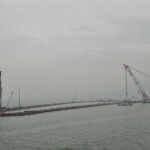 In addition, most of the top engineers for the bridge project, safety administration, environmental protection agencies, government officials, and top level engineers from the China Construction Communications Bureau came to watch the first pile go into the ground. 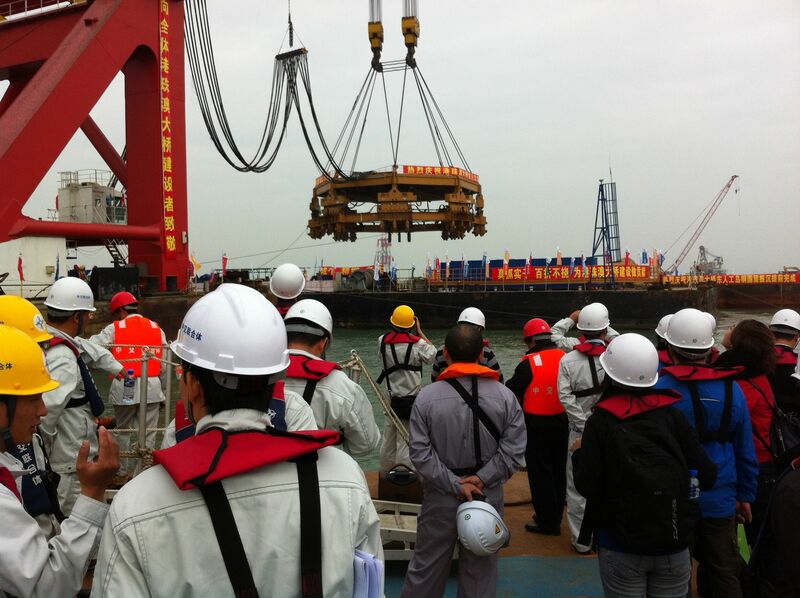 Over 8 boats and 3 ships were in the vicinity to witness the historic operation. 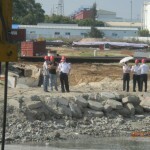 Number 3 marine also had a sand-pile-ship nearby that moved closer to allow for more people to stand and watch. 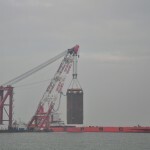 Over 200 people came to see the first pile be driven. 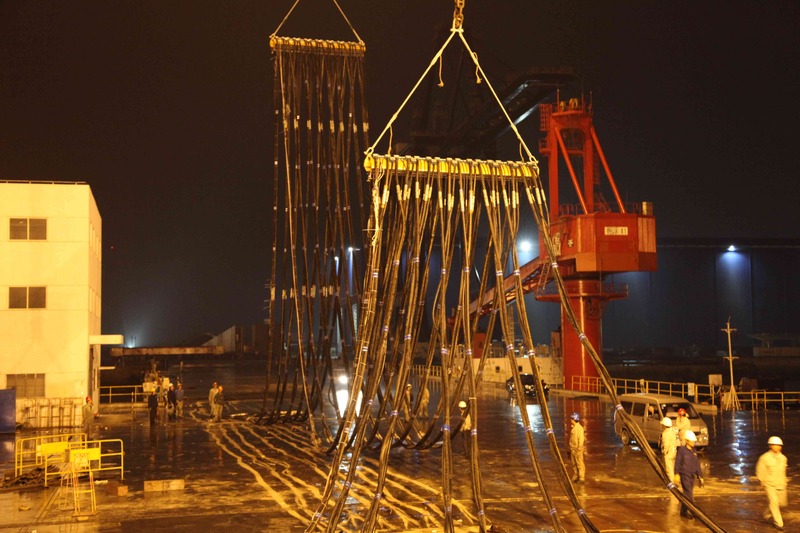 Prior to the drive many fireworks were lit off on all the surrounding boats and ships including a ship owned by competitor Number 3 Marine Bureau to wish the project luck. 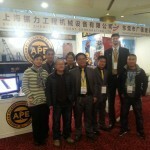 Jerry Cors (Production manager for APE and the Octa-Kong) myself (MD of APE China and technical lead for the Octa-Kong and Shell-pile-wall project) , Mr. Yang Yun Fu (APE China’s engineer) , Mr. Derek Hu (APE China’s assembly manager) , and Steve Gough (International sales for APE USA and head of China sales) were present to run the machine and verify all went smooth. 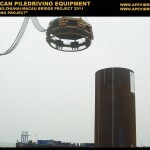 It was a sight to see and I hope to post more information about the project on the APE CHINA website, including a video of the operation (www.apevibro.cn). 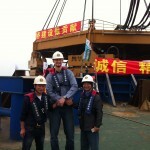 I have also made the APE China site in both Chinese and English for better communication. 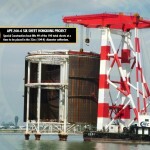 Congratulations to all who were involved! 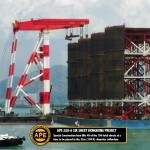 and Congratulations to APE USA. 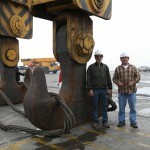 I want to give a special thank you to everybody who worked on this project and made this day possible. 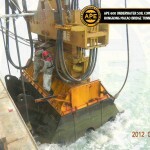 When the Competition Says “They Can Do It”… Talk to Someone Who Has “DONE IT” Call APE! 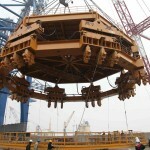 The world’s largest vibratory pile driver is now complete. 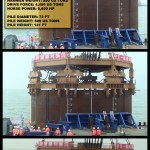 I want to send a personal thank you to everybody who helped make the Octakong a reality. 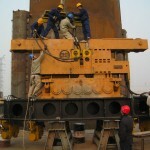 From the engineering, machining, fabrication, purchasing, assembly, testing, packing, shipping, and re-assembly in China. 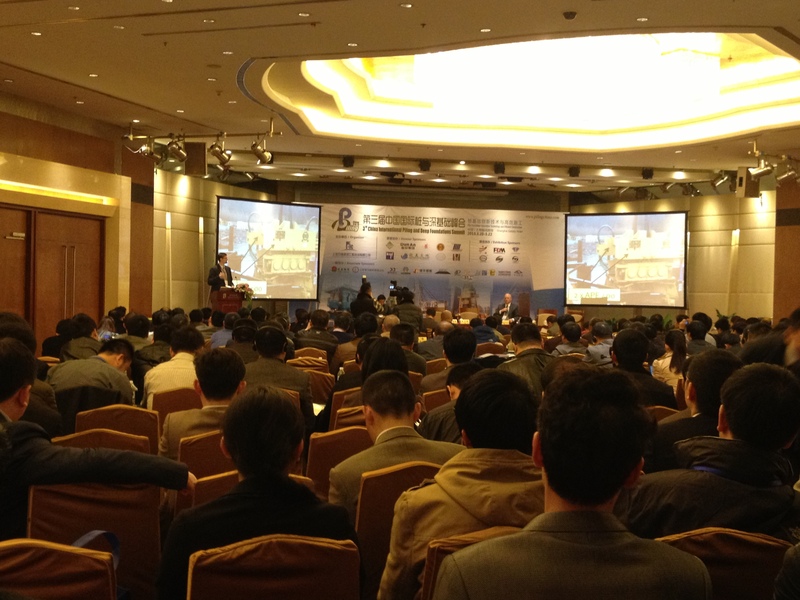 All of APE China thanks you! I know that many of you worked many long hours to make the Octakong come to life and I want to let you know that you should be proud. 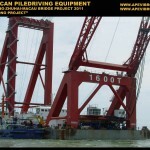 The equipment to drive the world’s largest bridge piles will be done with American made equipment. 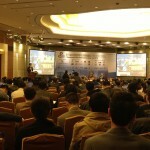 I am proud of APE and all of our vendors for working so hard with us. 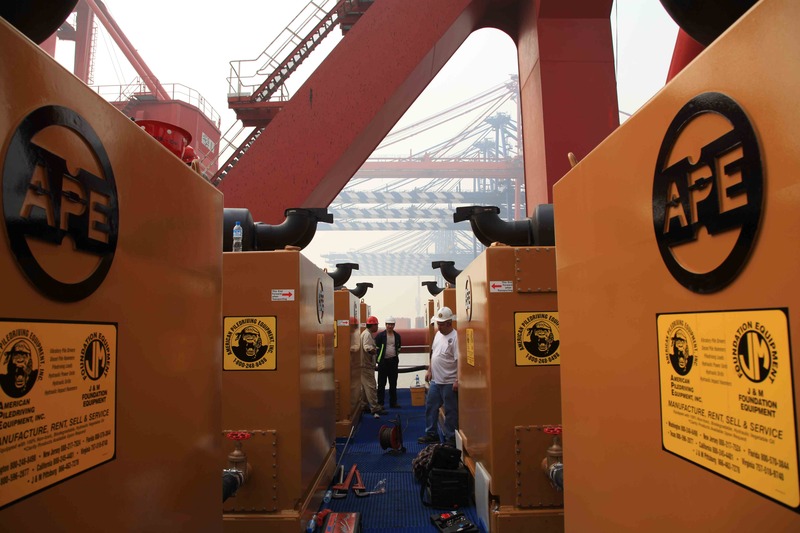 First Harbor Marine Group of China, which is the largest marine based construction group in China, was very impressed with APE’s quality, professionalism, and speed in which we made these 8 hammers. 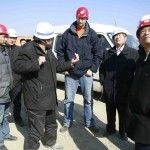 With Chuck, Daniel, Jerry, Pavel, Mike, Yang, Steve, and myself along side a team of 50 people were able to assemble the Octakong in 12 days. 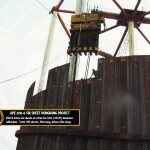 This was no easy task and the eyes of the pile driving world are upon us as we now await to drive our first test pile on May 5th 2011. 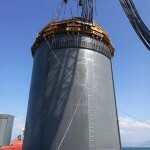 If the 72 foot diameter (22 meter) pile can be driven successfully, then it will change the way many other projects around the world can be done. 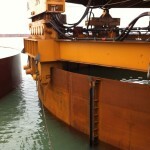 The Octakong will save nearly 2 years of time compared to using sheet piles. 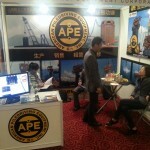 Yesterday was a big success for APE China and APE USA. 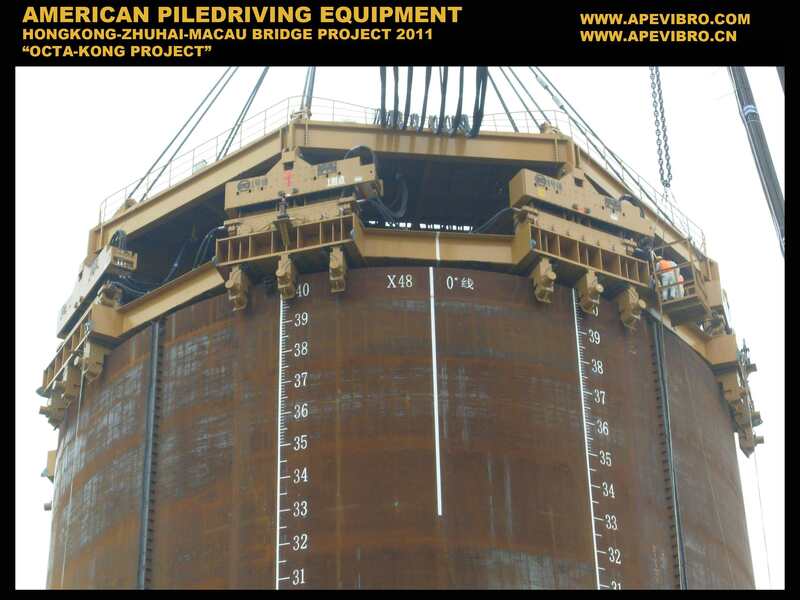 We successfully drove the world’s largest sheet pile (shell pile wall) in 11 minutes of drive time. 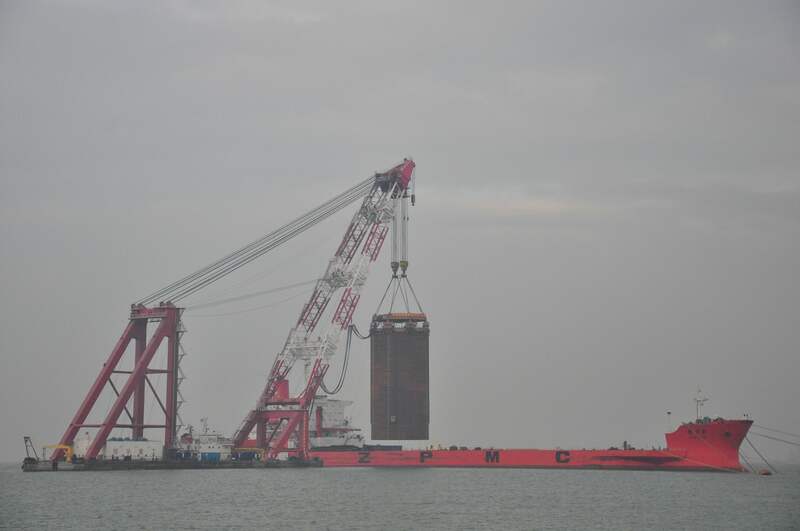 The pile was 11.3 (37 feet) wide and 22m (72 feet) tall and 16mm (.62″) thick. 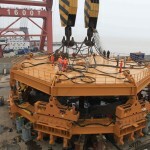 The pile was driven with a tandem APE 200-6 hammer (built at APE China) powered by two 1050HP Cummins engine power units (also built in APE China). 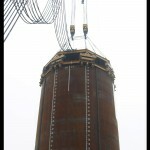 The hammers were mounted to a special beam designed by Casper, Phillips and Associates. 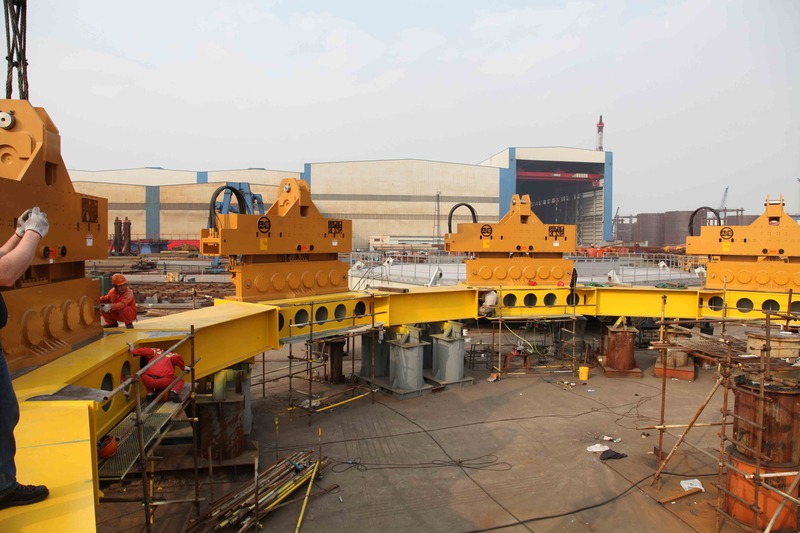 The clamping system was also made at APE China using 4 short cassion beams and 4 APE model 200 caisson clamps. 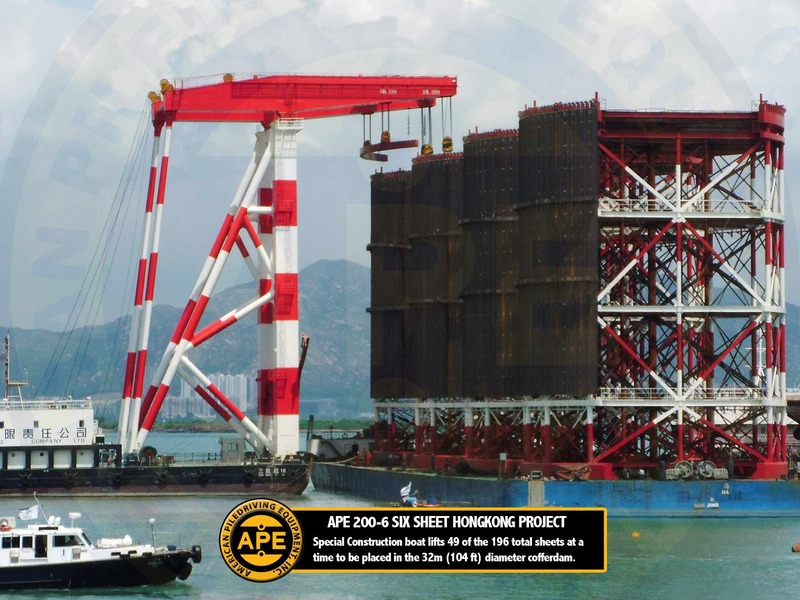 These shell pile walls will be used on the Hong Kong-Macau Bridge project, currently the largest construction project in China. 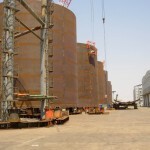 The decision to use a single shell-pile-wall instead of sheet piles came about for several reasons. 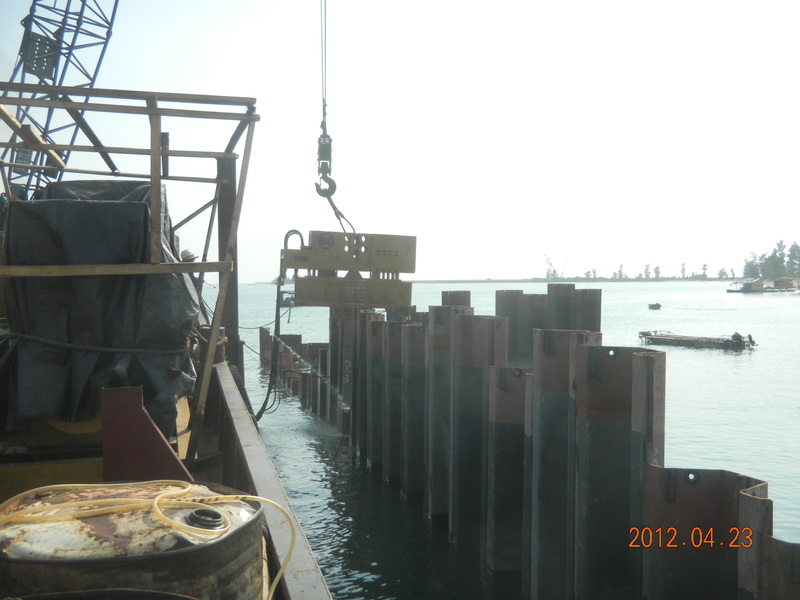 The first reason being that driving sheet piles out at sea is very difficult and time consuming process. 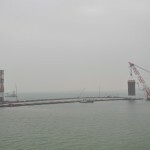 In order to fit the time line of the bridge construction completion date they will need to complete 2 shell pile walls per day. 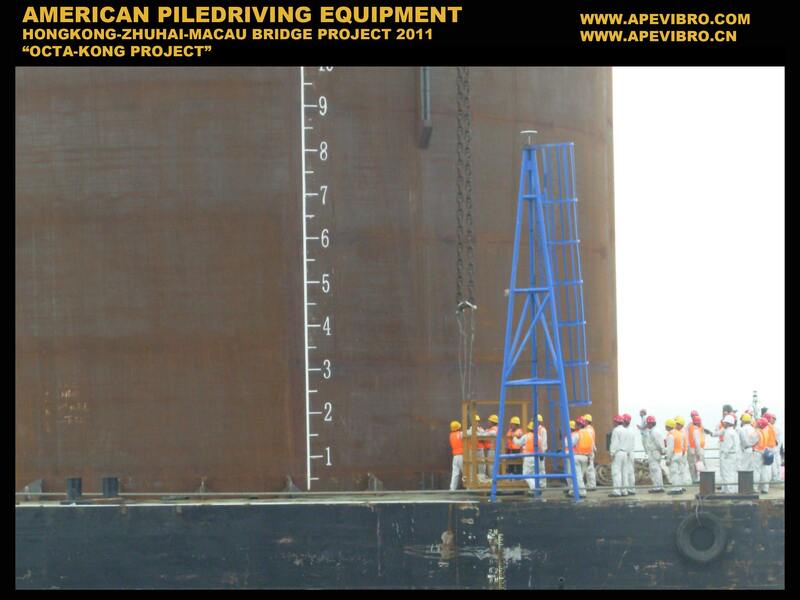 Driving sheet piles would be drastically slower. 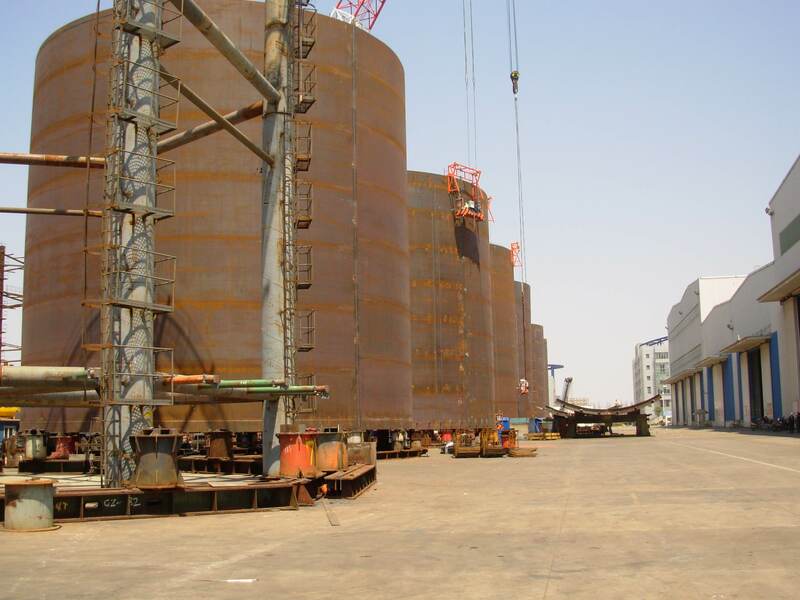 The second reason to use shell-pile-walls instead of sheet piles is due to margin of error of the large diameter cassions that these shell-pile-walls will be interlocked to. 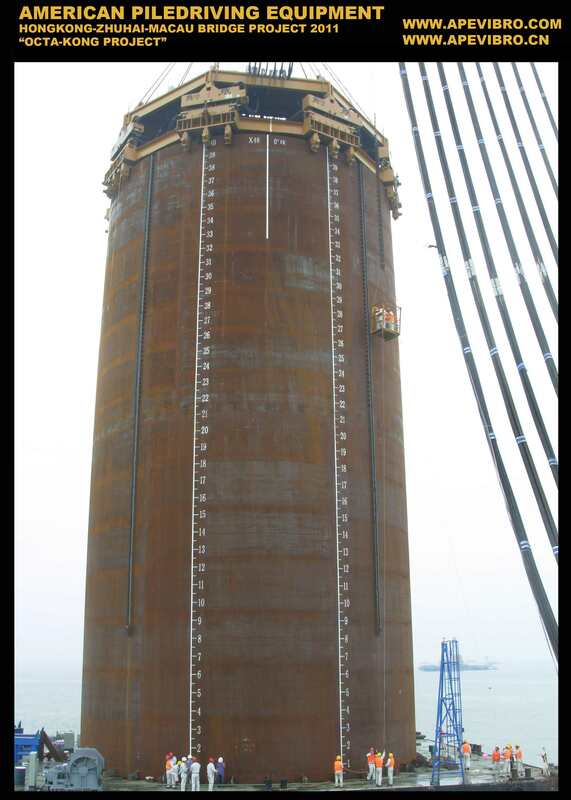 In our test situation, the interlocks that the pile was to fit into were .5m (1.64 feet) wider at the top than at the bottom. 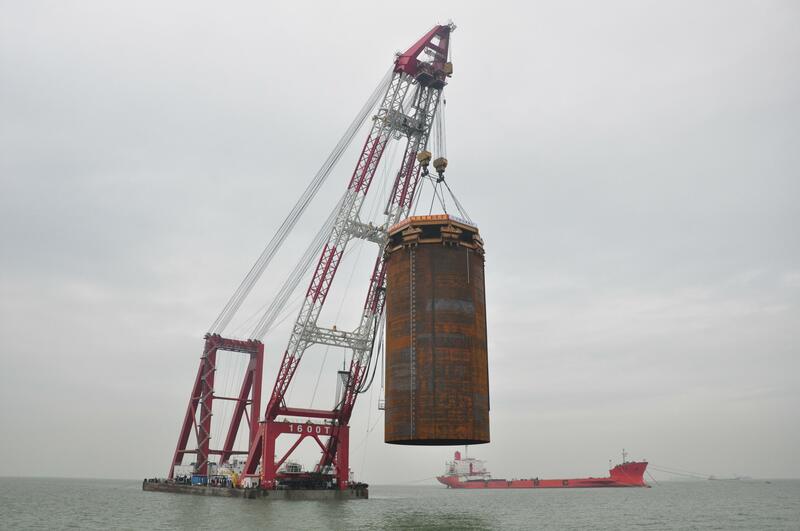 This means that as the pile was driven into the ground it was literally being compressed by 1.64 feet, causing the pile to bulge out and create added resistance. 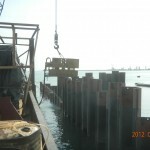 If this job were to use sheet piles it would be extremely difficult to custom shape each sheet pile to fit the unknown margins of error between each interlock. 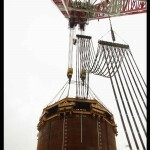 The importance of the success of this project are far higher than we originally expected. 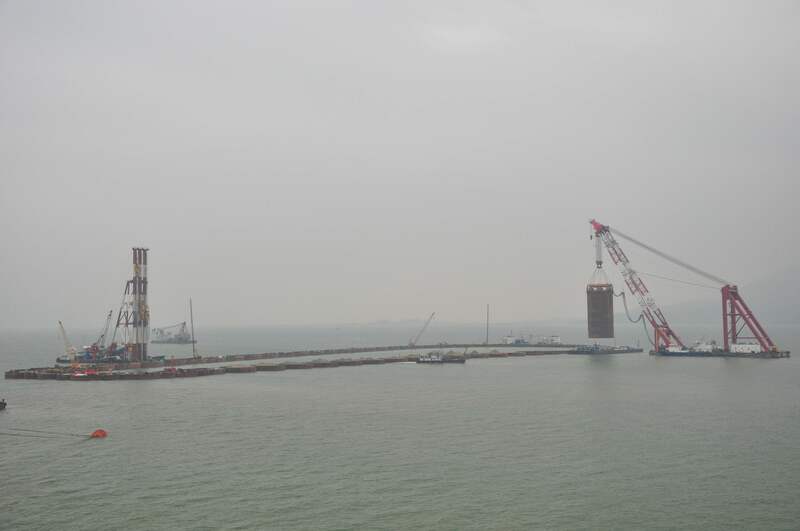 The fact of the matter is that if this shell-pile-wall pile failed than it would delay the entire Hong Kong Macau bridge project and also create engineering nightmares to think of a new design that can meet the time line given. 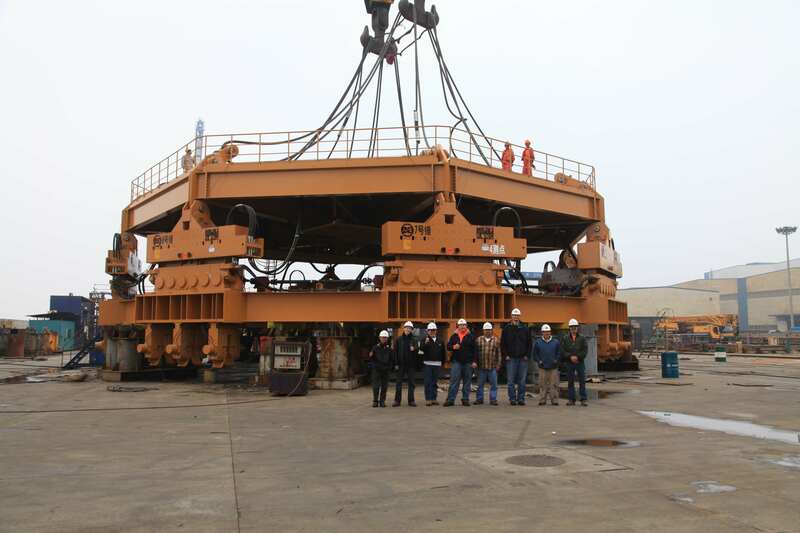 All of the top officials in charge of the entire bridge project were present to verify with their own eyes the success or failure of the APE tandem 200-6 system. 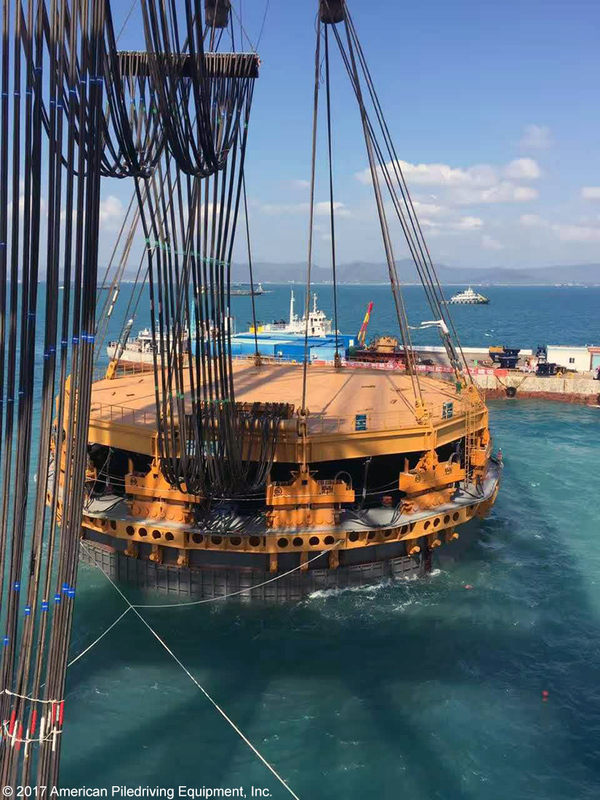 It is now safe to say, even in the most difficult conditions that will be given during the project, this pile can be driven with success.